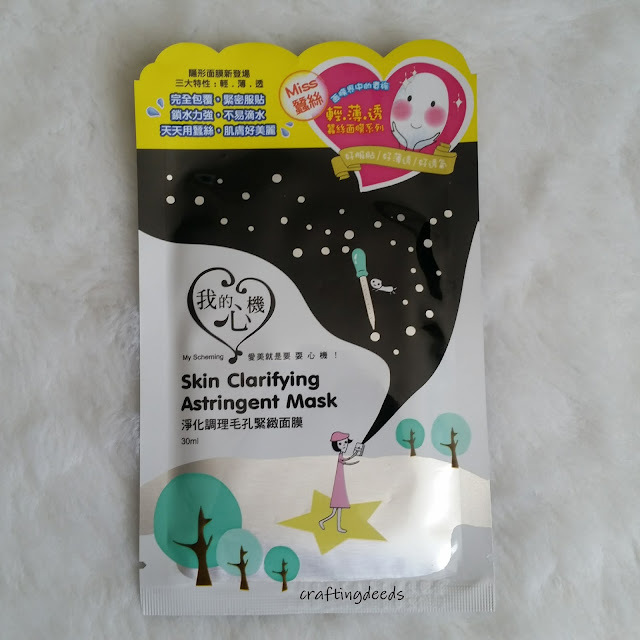 I am back with a review on another Taiwanese mask~~ It's not Lovemore this time! 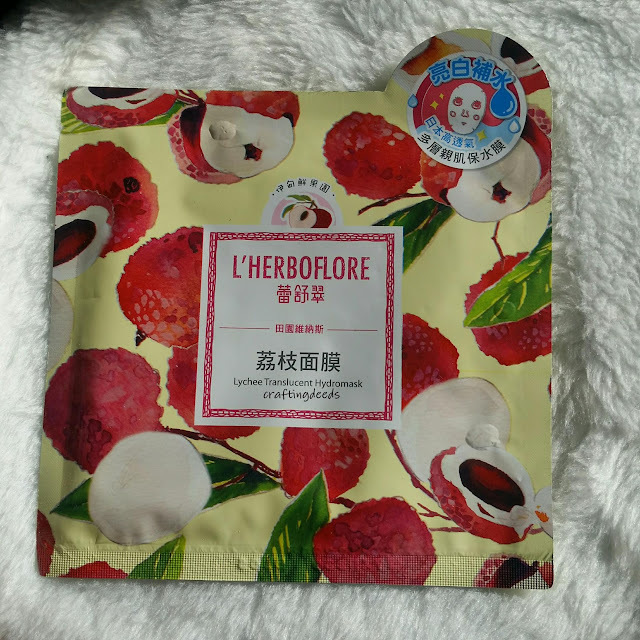 It's L'Herboflore and the Lychee Translucent Hydromask. Which is also a mask I picked up from my BGO haul from a few years ago along with the Lovemore masks. I tried it before but was meh about it so I thought I give a few shots before I completely write it off. 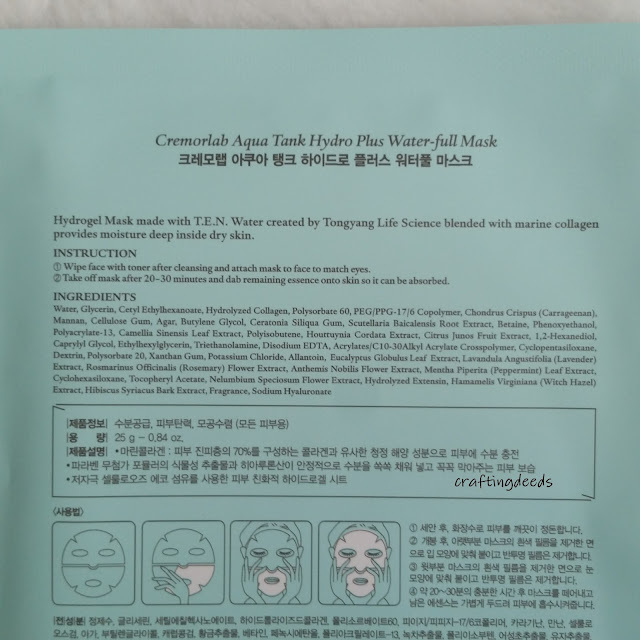 The mask has deep ocean water, which is what I smelt when I opened the mask, along with other plant extracts to deliver nutrition to the skin. It is supposed to brighten your skin and leave it feeling finer. Continuing on with my Oriental series from Lovemore, it is the Yurong Scattered Amazing White Mask Sheet. Don't ask me why they named it this way. XD I think it's a literal translation. This is supposed to revitalize the skin and obviously brighten it. This will be a short review as there is not much new to report. 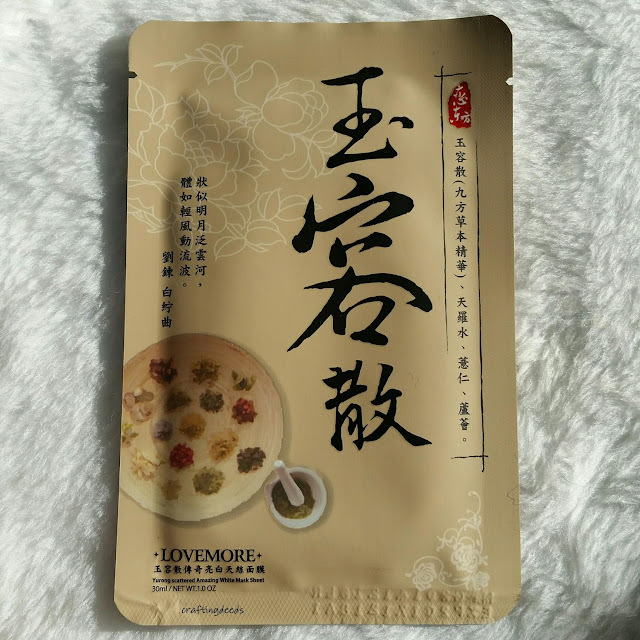 The mask is similar to the two other Lovemore masks I reviewed from the Oriental series. It comes between a white stiff backing and a softer blue backing. It is a very thin silk sheet mask that is drenched in essence. The essence has a very faint smell that reminds me of the shampoo and conditioner that I used when growing up. It was just these cheap ones where the conditioner is just a thick yellow cream that reminds me of pudding. The fit is good as the others, with just a little bit too much on the forehead. 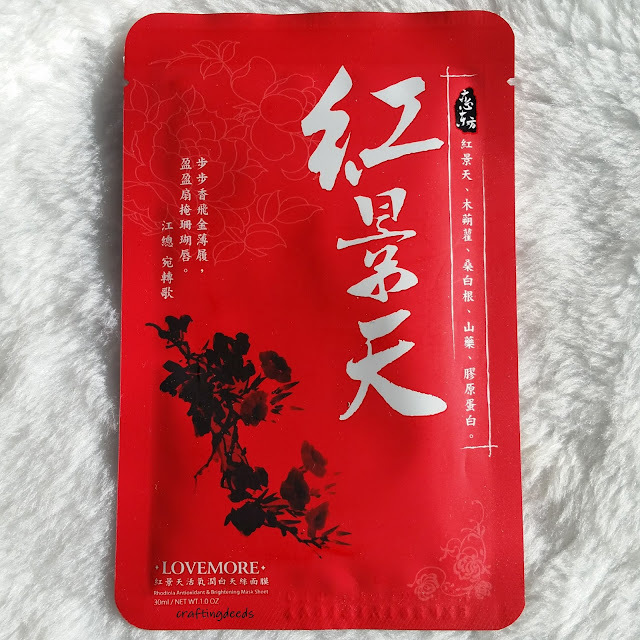 Following my previous post, the mask today is also from Lovemore's Oriental series. It's the Rhodiola Antioxidant & Brightening Mask Sheet. 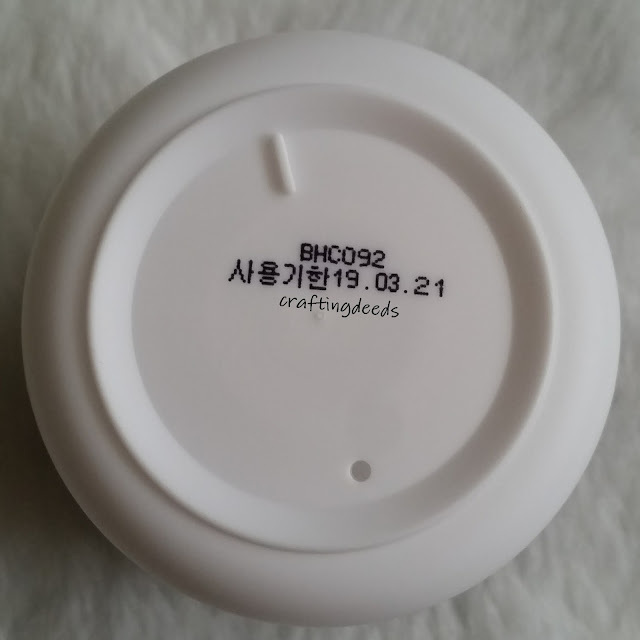 It's supposed to revitalize the skin with Cubilose and Kampo ingredients. 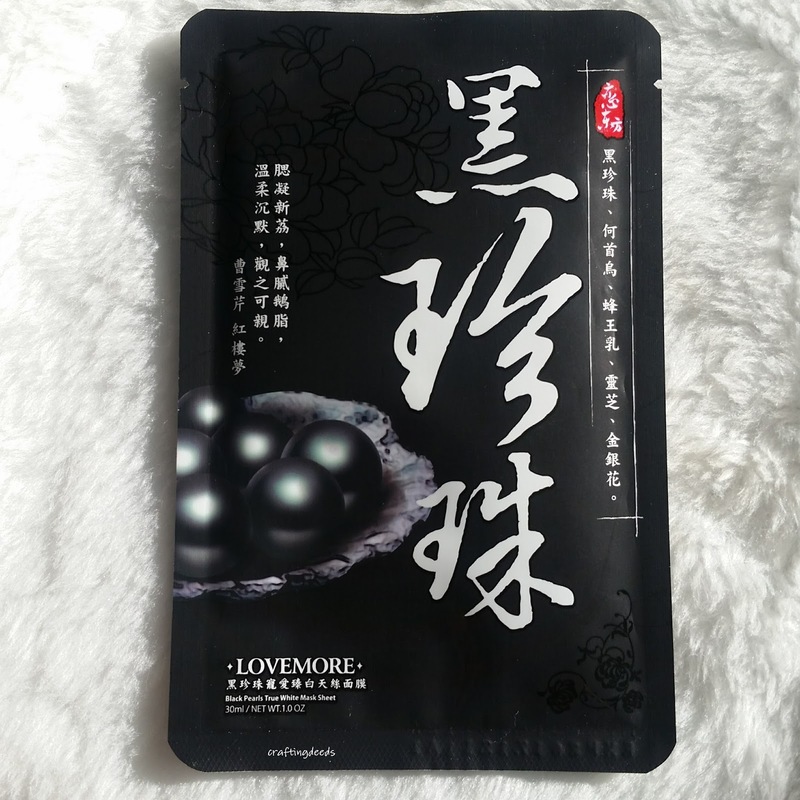 The first one I tried is the Lovemore Black Pearls True White Mask Sheet. This is advertised to revitalize, as well as moisturize and brighten your skin. The mask was soaked in a clear serum like essence, and dripped a little bit. Thankfully, it wasn't letting out a stream of essence like the My Scheming masks. The essence has a light artificially sweet scent to it. I am not a big fan of it and I am thankful that it is not overpowering and only occasionally waft into my nose. 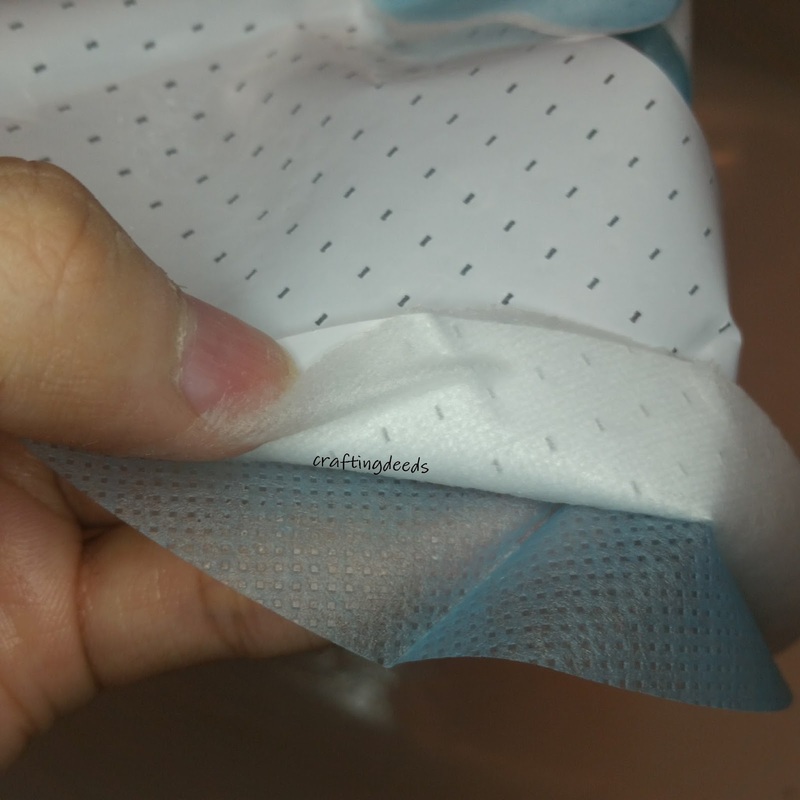 The mask is wedged between a stiff white backing and a thin blue backing. 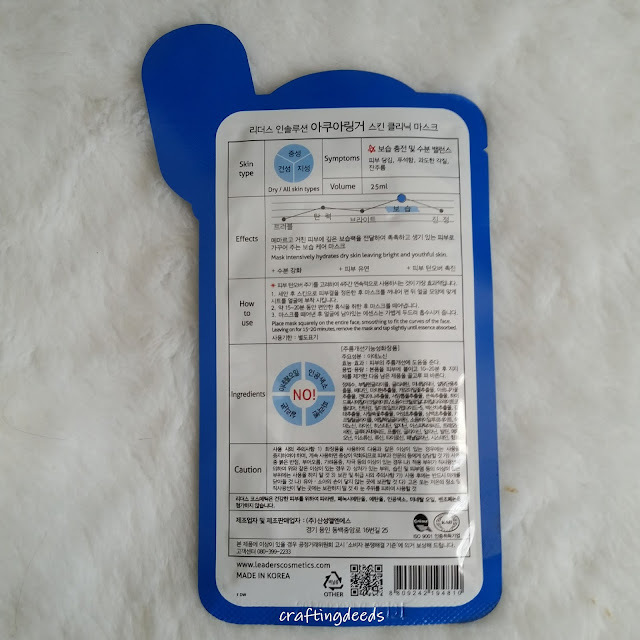 The idea is to remove the white backing and use the blue backing as a guide to put the thin mask on your face. That haven't really worked well for me, so I just take off both and put them on my face while looking in the mirror. The silk mask is very thin so adheres well and looks like I have nothing on my face. The fit is pretty good, with a little extra flap on the forehead. The nose portion is meh but I kind of screwed that part up when I put it on so I can't fault the mask for that. The recommended time is between 10 to 15 minutes. I had it on for about 25 minutes, at which point the mask has become more opaque. The extra essence on the skin sunk in relatively quickly. It kind of made my skin tingle as it was sinking in. I can tell it had fully sunk in once it stopped becoming sticky. My skin felt moisturized, and I didn't really notice much brightening effect. But in comparing my before and after pictures, my skin did get a little bit brighter. Would I repurchase it again? The answer is no. Even though it is readily available at the Chinese supermarket, the masks just did not impress me. 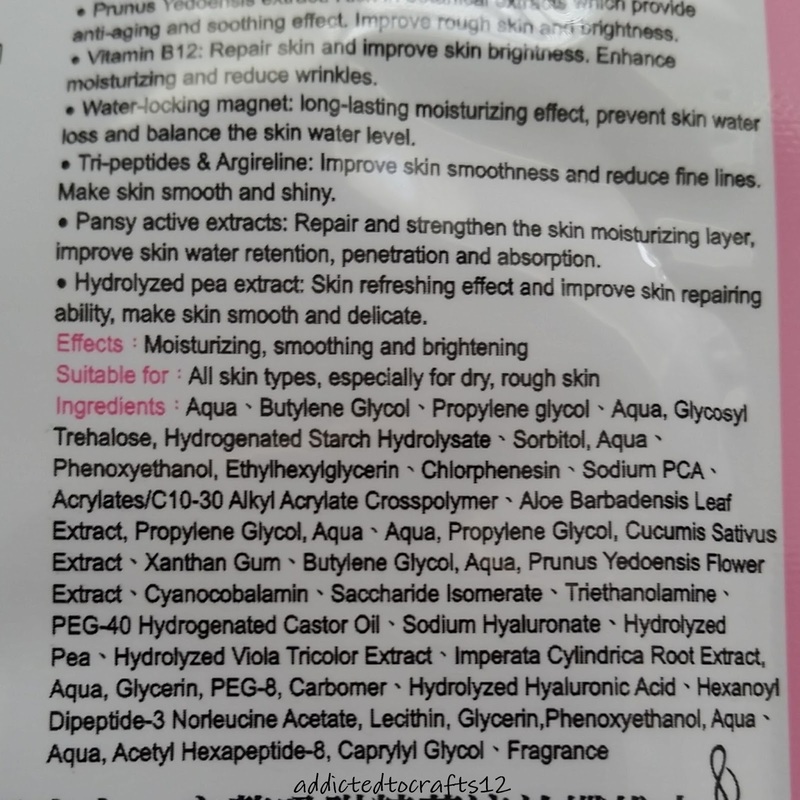 If I want a hydrating mask, I have so many different options to consider at a cheaper price. And I don't often want a brightening mask so that aspect is lost on me. I am looking forward to finishing up the box and never buying these again. 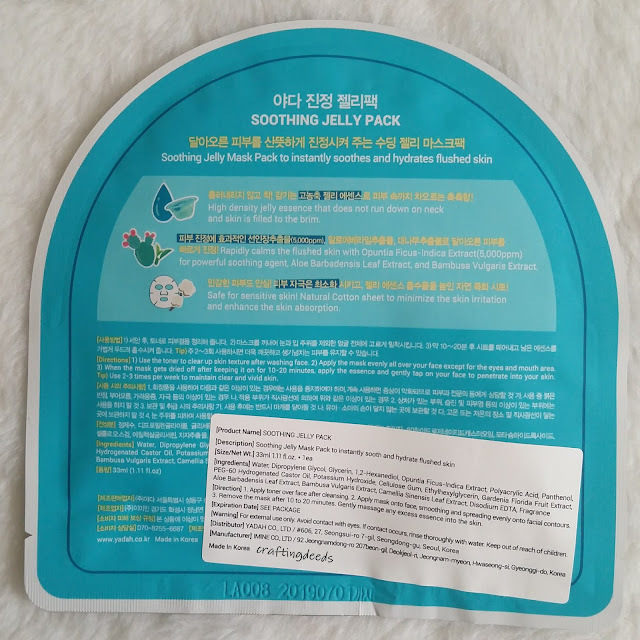 I had grab this Skylake mask from TesterKorea a while ago, but I totally forgot what flavour it is as they are the same packaging for all of the different flavours. 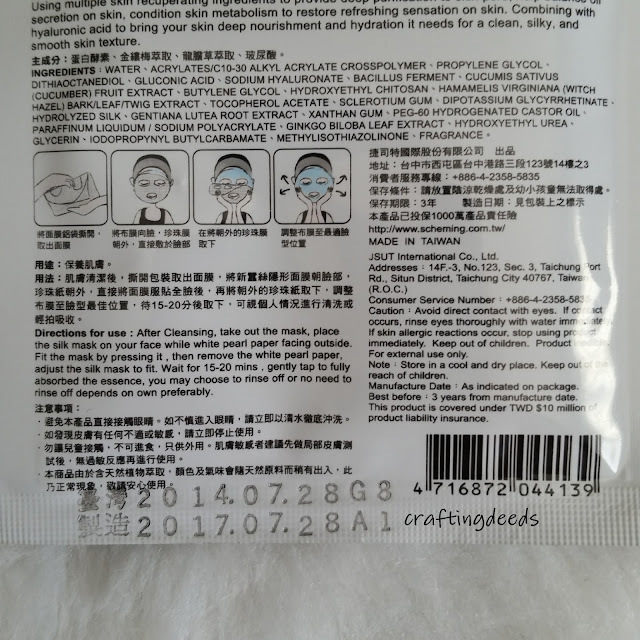 Good ole' Google Translate told me this is to clean and revitalize dull skin. 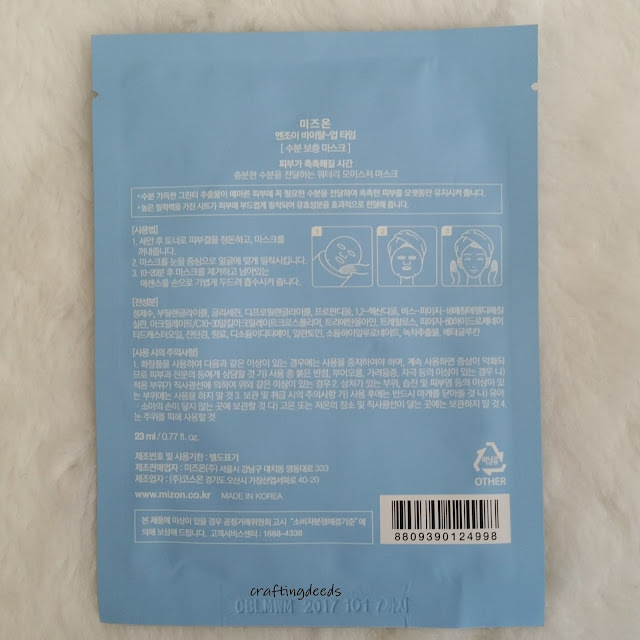 I received another product from Jolse! I am surprised I won again! 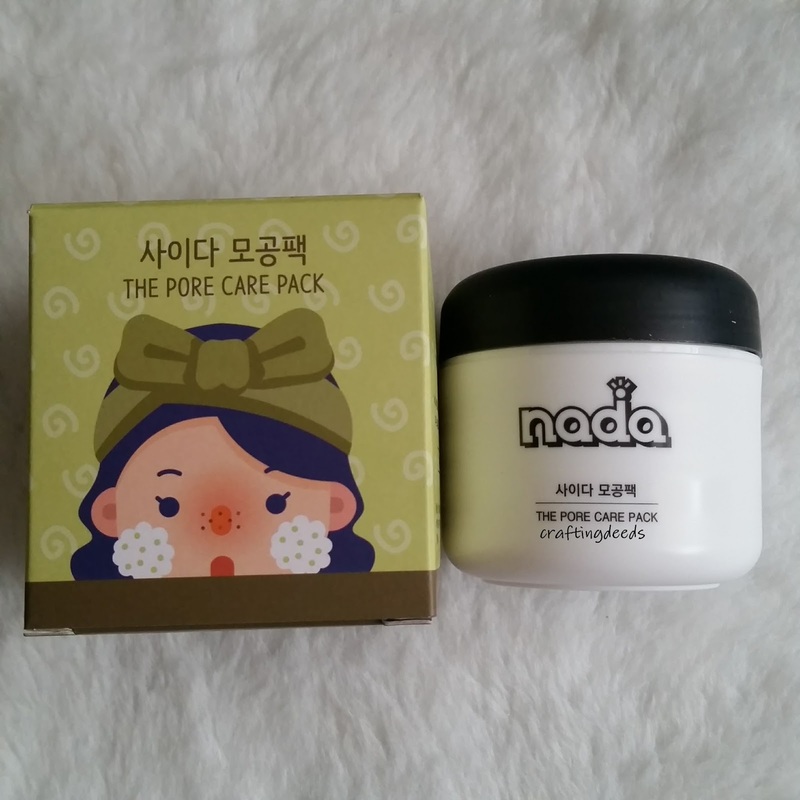 This time it is the Nada Soda The Pore Care Pack, which is a clay mask. I was excited to receive it as I thought it was a bubbling mask. Look at how cute the packaging is! Cute packaging always get to me and it was one of the reasons why I applied for this product! That aside, I wasn't paying too much attention when I applied for it so I was surprised to see how tiny the product was. Then I read the description, and realized I screwed up. Hahaha Oops. 😅😆 It's only 50g so of course it's going to be small. Hahaha. Even though Jolse sent this to me for free to review, all opinions in this post are my honest opinion and by no ways was influenced by the company. The mask itself looks quite fluffy! Not like the standard clay packs which tend to be in a tube and a bit more on the cream side. Whereas this is like a whipped cream. 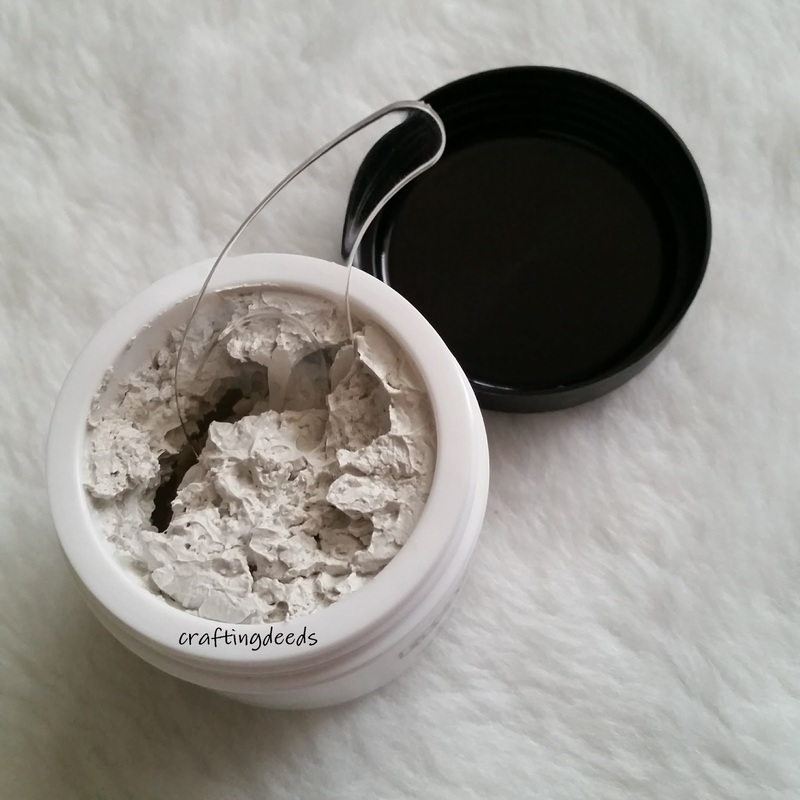 It also includes a plastic spoon to easily scoop out the clay mask. The good thing about this is that it expires in 2019, meaning this is a fresh product!!! Onto the product testing. I must say, this whipped cream texture make it so easy to spread!! I just use the back of the provided spoon and it spreads like a dream. The mask smells like those Naive face washes and feels cool against my skin. It forms a bubble but it's quite big bubbles. If you wan to see them.. Get ready to become close and personal with my face!!!! This is when I first applied the mask and it started to slowly bubble up. As you can see, I have applied quite a thick layer of mask. Which is wrong by the way. I learned later on and will explain down below. Can you see them bubbles? It kind of forms a layer of bubble on top of the mask itself. So it's almost like I have a thin layer of spider webs on top of the clay mask. And when the bubbles are popping, those particles you see that's laying on top of the bubbles? They pop off, so it ends up sending dried clay particles into the air. It kind of makes for a semi dirty experience. You ca see what I am talking about a little bit more clearly here. See the separation of the layers? Here too. It made me wonder if I am maybe not applying it correctly and that's why it's separating into two layers. 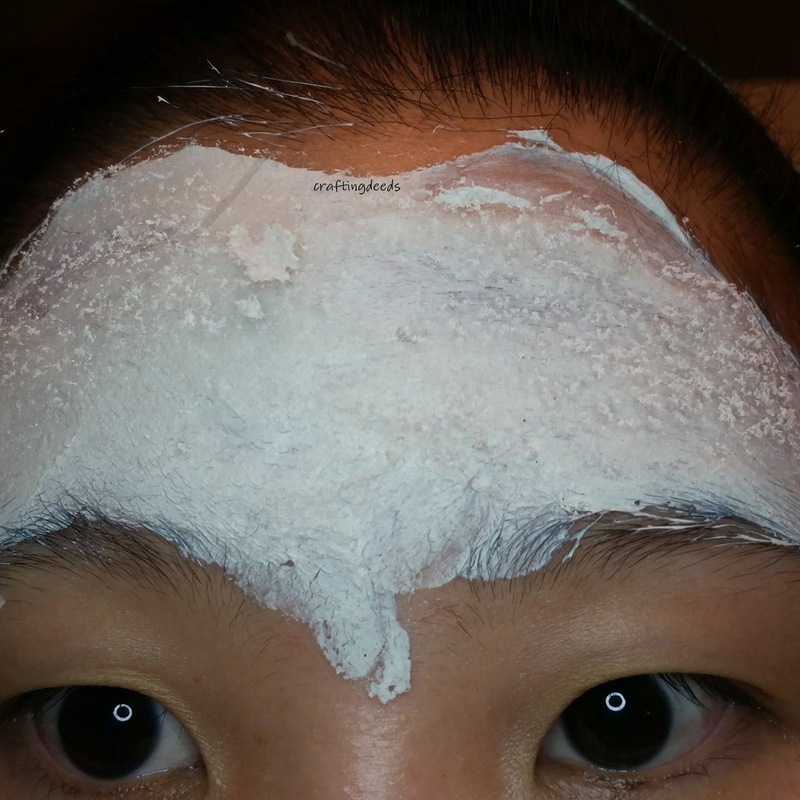 So I went on Jolse's product page and it showed that the users all used a thin layer of the clay mask. Which made sense since it's only 50g of product, if I continued to use the amount of product I was using, this little tub would be done within 5 uses. So I decided to try it again but use a much thinner layer. 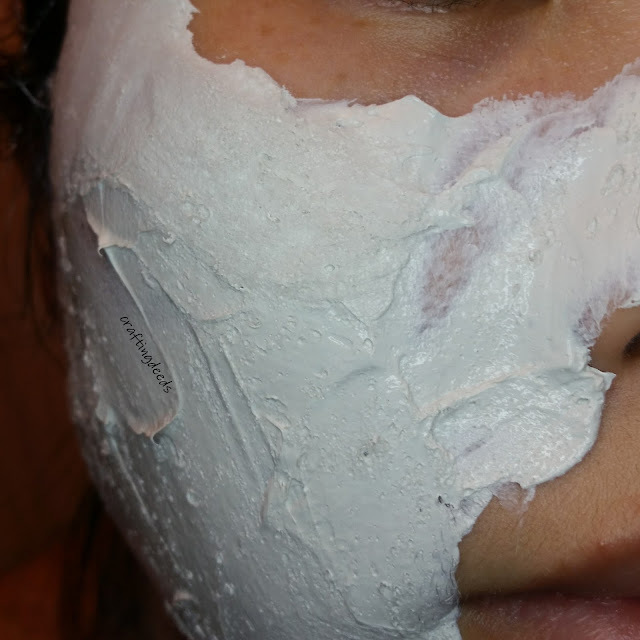 Because this is a whipped mousse texture, the mask is easily spreadable and it was quit easy to spread a thin layer on my face. This is with a thin layer. The same separate layers, bubbles and mask, occurred. And because it is a thinner layer, the bubbling started way quicker. So yes, I had a brain far the first time around and used WAY too much product. One big scoop with the spoon is more than enough for the face. Here I intentionally took a swipe so you can see the difference between the bubbling layer and the clay layer underneath. It had the same issue as the thick layer, where when the bubbles explode, the clay parts on the bubble burst into the air and kind of make it a little dirty. Here is what the swipe looks like once it is dried. I do feel like it declogged my pores a little bit and it is a fun experience. But I wouldn't repurchase this as I am not a big fan of the clay particles bursting into the air as the bubbles explode. It was a fun experience though and I am thankful for being able to try this. This is a collection of masks I have reviewed on my Instagram account. I am still in the consideration of how I want to post the reviews, whether if I want to post the reviews on the blog and IG at the same time, or if I should post it on the blog as a roundup post. Any suggestions you have would be greatly appreciated! 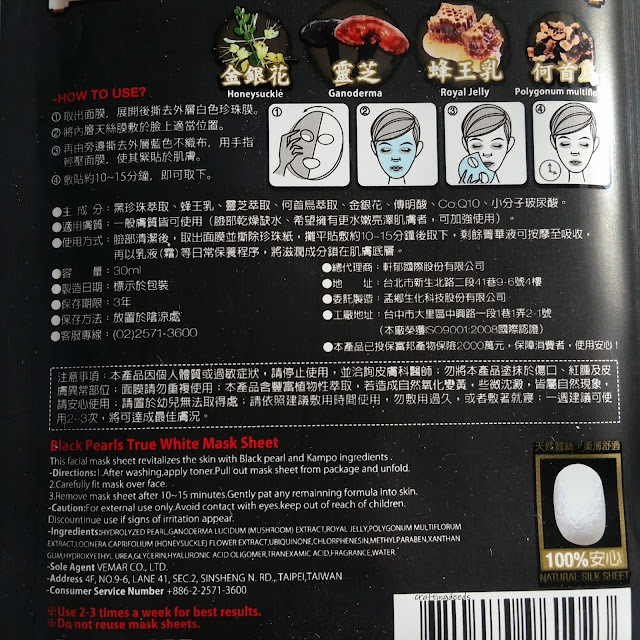 This mask has been on my wishlist for a while now, just purely based on its reported jasmine scent. I bit the bullet and bought it and could not wait to use it. This is a 2 step mask where the first step is 100% pure camellia oil that is to be spread all over the face before putting step 2, the sheet mask, on top of it. The sheet mask is a thin cupro mask that was a great fit for my face and looked almost invisible. It definitely smelled like jasmine heaven. In fact, I call this the jasmine heaven mask. 😍 That's how much I love the scent. The mask was on for 30 minutes as I wanted to have it on for as long as possible. The extra essence sunk in quickly and was not sticky at all. The result was immediate. My skin looked and felt chok chok. 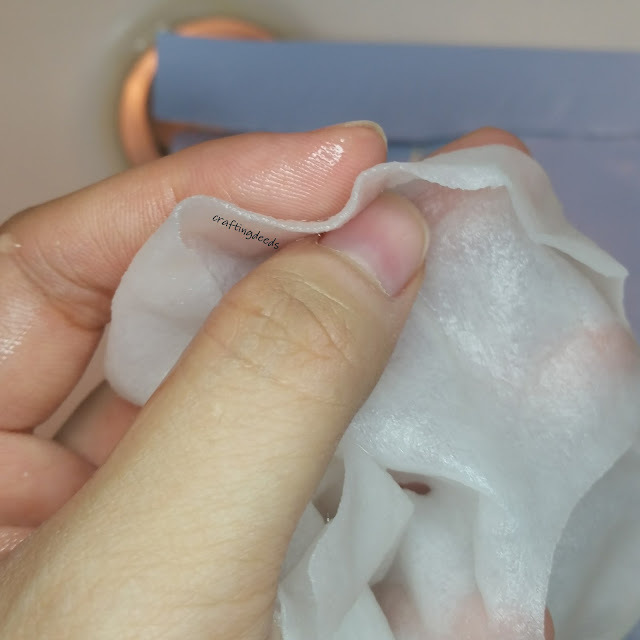 It was so soft and moist to the touch and the enlarged pores appeared to be smaller. I didn't continue with the rest of my routine and I still woke up with really moisturized skin the next morning. I am definitely buying this mask again as soon as there's another sale. In fact, I am still kicking myself for not realizing Urban Outfitters ship to Canada when they had the masks on sale for $2. So by the time I realized it, the only masks left were the red ones.. 😢😢Speaking of which.. That's the next review! 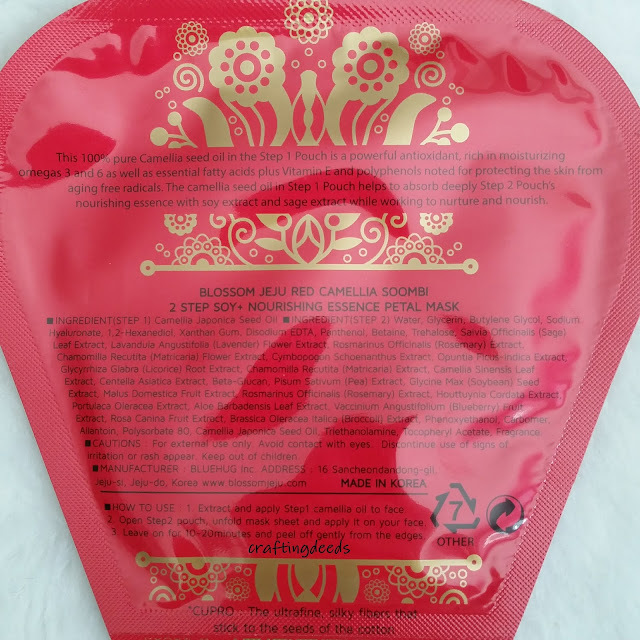 This is the red version, which is supposed to be nurture and nourish the skin. 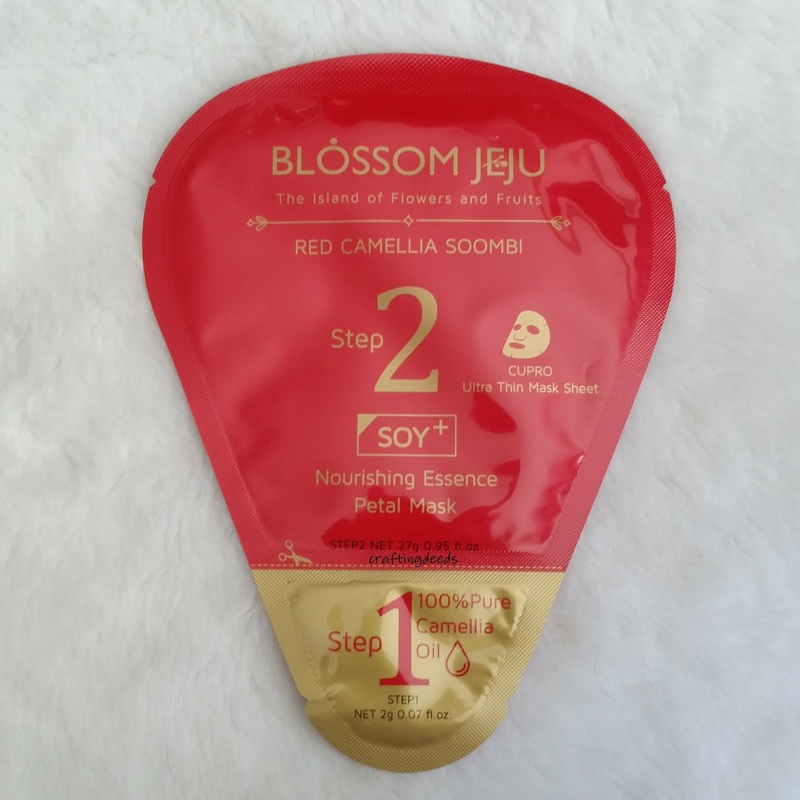 Similar to the pink version, the mask is a 2 step mask with step 1 being the camellia oil and step 2 being the sheet mask. However, the sheet mask has a different scent. It has a lighter, less sweet and a fresher floral scent. My brain says it is the night blooming jasmine scent. The mask stayed on for 40 minutes and that's when the upper lip area started to feel dry. It took forever for the extra essence to sink in and my skin felt tacky. 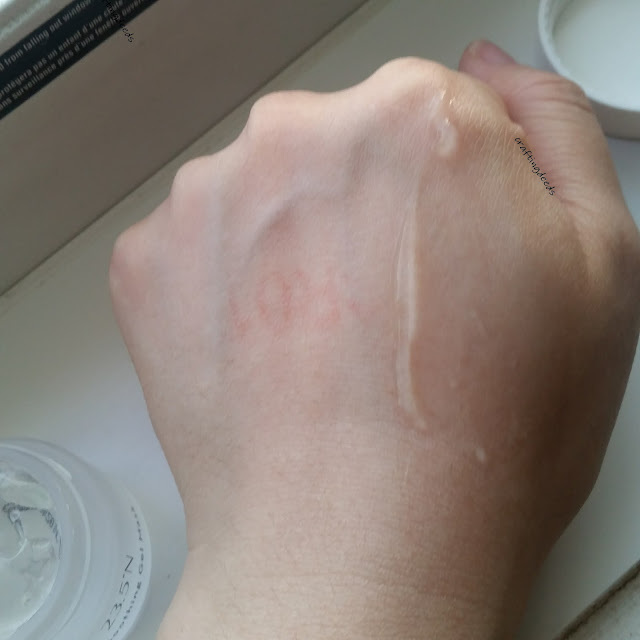 My skin felt dewy to the touch and it remained till the next day. I like this mask quite a lot as well. But if I have the choice, I would do the pink version. That being said, I did pick up 10 of these when Urban Outfitters had a sale on it and I religiously checked the tracking for it until it was delivered. Hahaha. This was a new find I found at Winners. 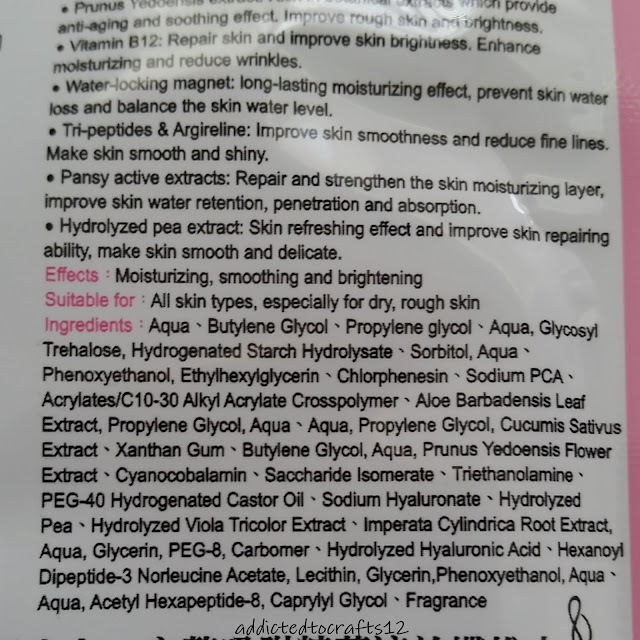 I was aware of the brand Yadah but I was confused as to what kind of mask it was. I decided to give it a try as it was $6 for 5 masks, which is not bad for sheet masks. This is turned out to be a natural cotton sheet mask that is covered in TONS of jelly essence that smells faintly of plants. I was surprised to see large chunks of jelly essence in the package! There was so much that I was able to cover the face in a thick layer and then my neck and arms. I had the mask on for 25 minutes and that is when the upper lip area was starting to dry out and I can feel the thick layer of jelly essence has been absorbed. The extra essence sunk in quickly and was not tacky, which was surprising since there was so much essence to sink in. My skin felt moisturized but it definitely still needed the rest of the routine to feel that softness of a well moisturized skin. I would repurchase it if I ever run into it again. 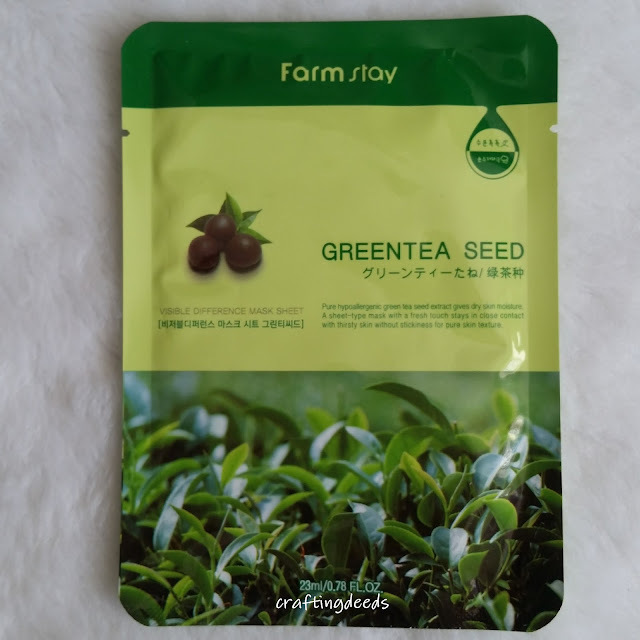 This is a standard sheet mask in a watery serum like essence that smells like the Elizabeth Arden gree tea perfume. It is a nice light and fresh scent. I had it on for about 20 minutes as the upper lip area started to dry out. The extra essence sunk in quickly and was not sticky. However, it did leave my skin look a bit shiny. It also made my skin look dewy, but also feel like the product is just sitting on top of the skin instead of sinking in. Eventually that feeling went away, and my skin felt a lot less dewy to the touch. I didn't have high expectation for the mask and it kind of delivered that meh result. It did moisturize my skin but it didn't have that wow factor that makes me want to repurchase it. 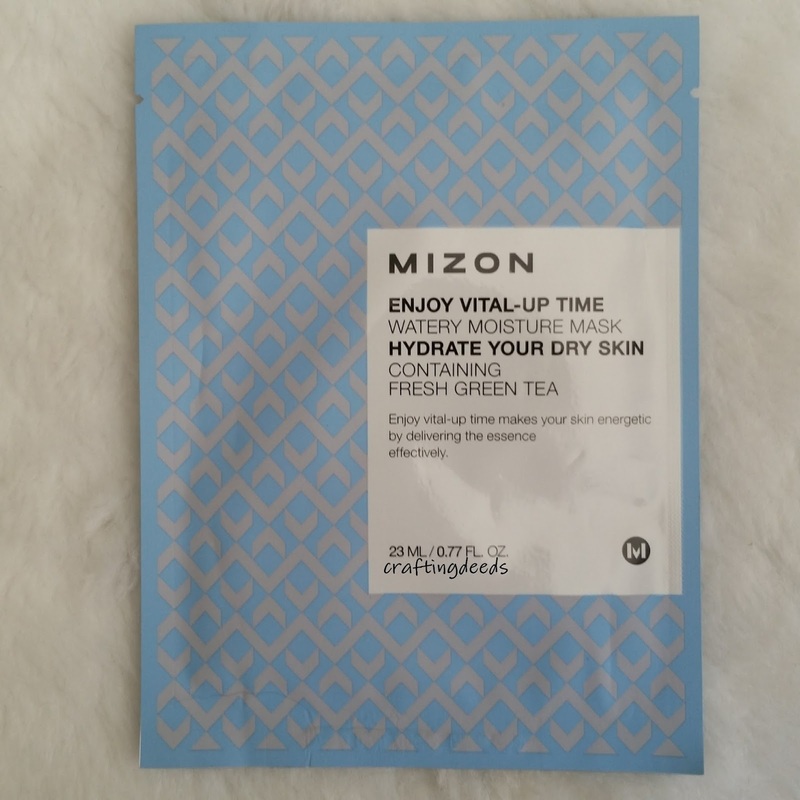 Following up with the Mizon series, I decided to try the soothing mask to soothe the bumps I found on my face. 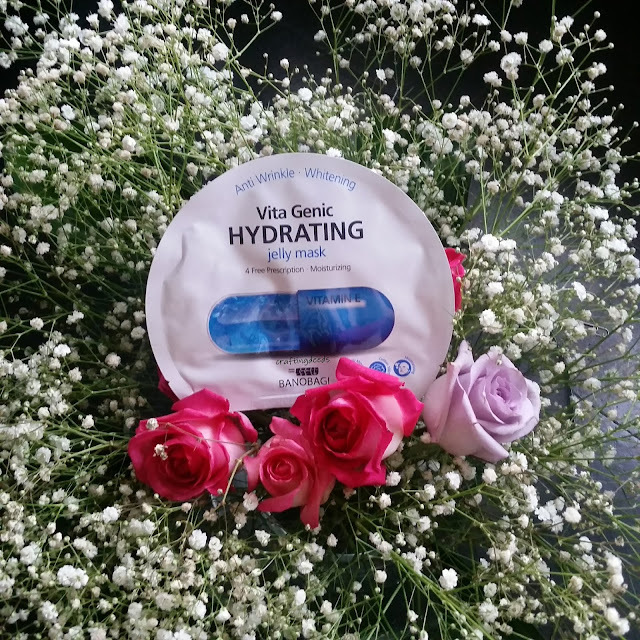 This is a similar mask as the hydrating mask reviewed above. Unfortunately, this did not make it to my face s I realized it has lavender. I knew it has lavender as it was right there on the package, but I was hoping for a very faint scent so I can't detect it. But this mask has a strong scent that I do not like at all so this went into the garbage. Clearly this will not be repurchased by me. This is a mask that was quite costly but I thought I give it a try as it isn't well reviewed. This is advertised to have the T.E.N water and marine collagen that will provide deep moisture to the skin. 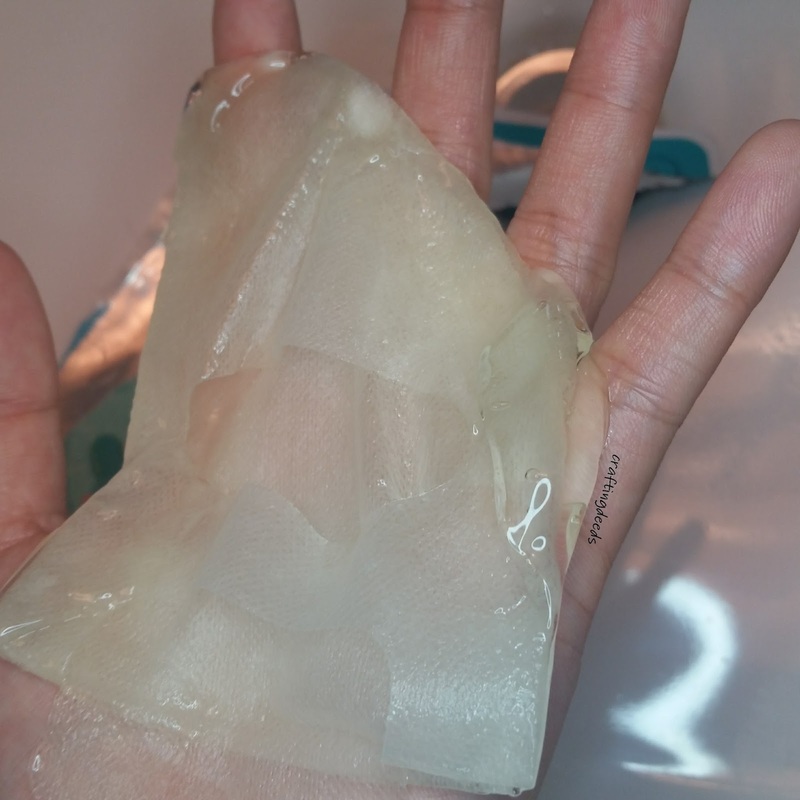 This is a two piece hydrogel that comes wedged between a stiff and a softer backing. It has not excess essence but it smells just like a light caramel drink, which is heavenly. 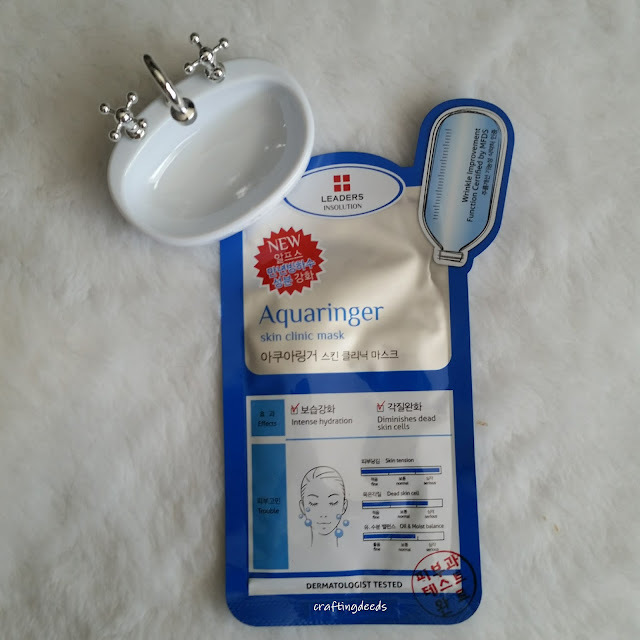 😍 The fit for the hydrogel wasn't bad as they tend to be on the smaller side for me but this one has a similar fit as a sheet mask. I had this mask on for 25 minutes but I have to admit the upper lip area started to dry out by the 15 minutes mark. It didn't leave much extra essence, and whatever that's left sunk in quickly. It left my skin feeling cool to the touch and was not tacky. 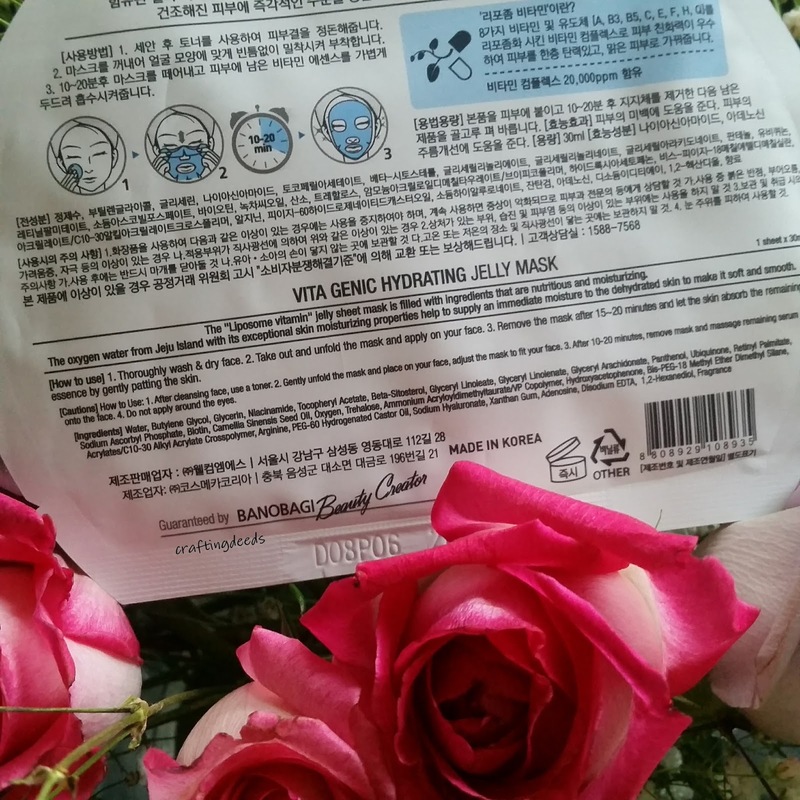 It made my skin feel moisturized but it didn't make feel soft or dewy. 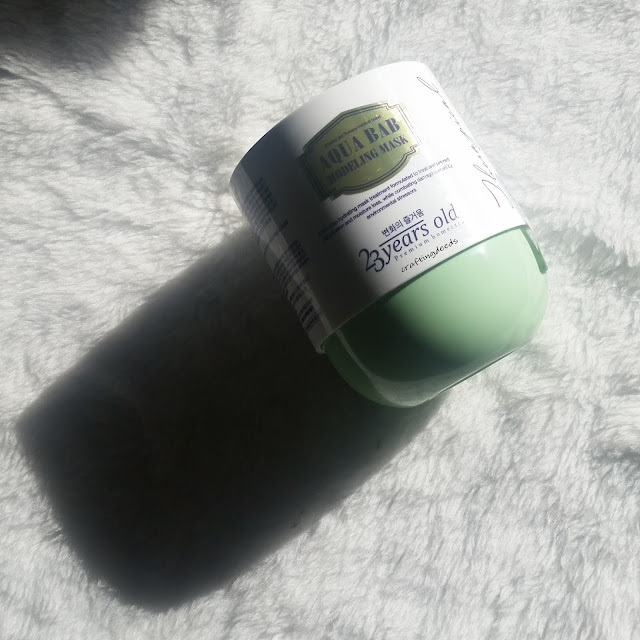 It just feels more moisturized and it made the application of essence and emulsions feel much smoother. 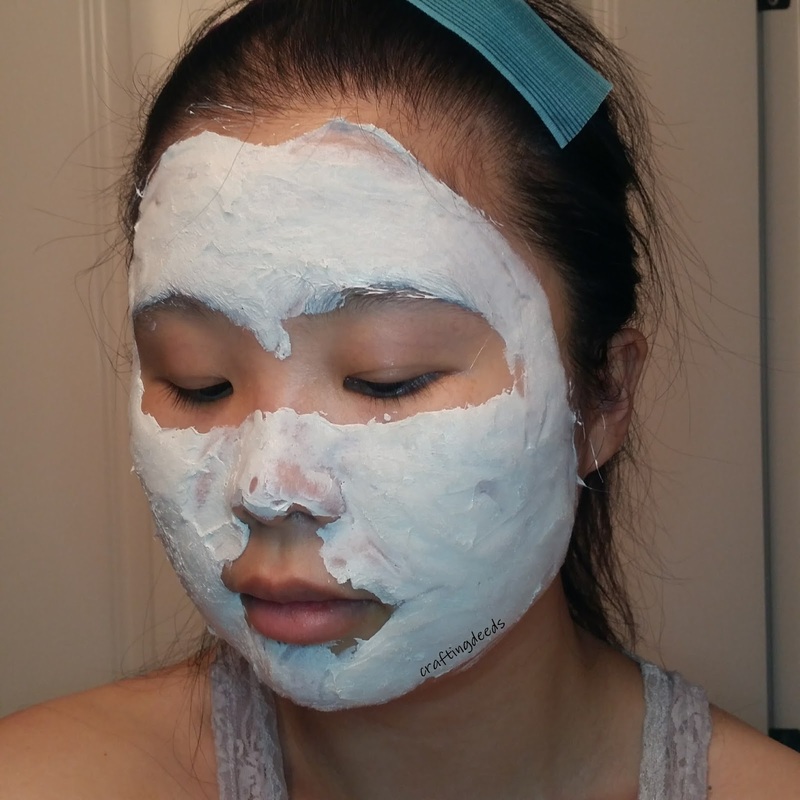 I did feel like this mask evened out my skin a little bit and reduced the redness. But like I said above, it is pretty pricey at $9 per mask. I wouldn't repurchase it as the result was not so amazing that it warrants that price point. I been eyeing this mask for a while and when I saw it was on sale for $20 for a box of 10 at the local Asian store, I had to make my friend pick up the last two boxes for me when I couldn't find it at the location near me. 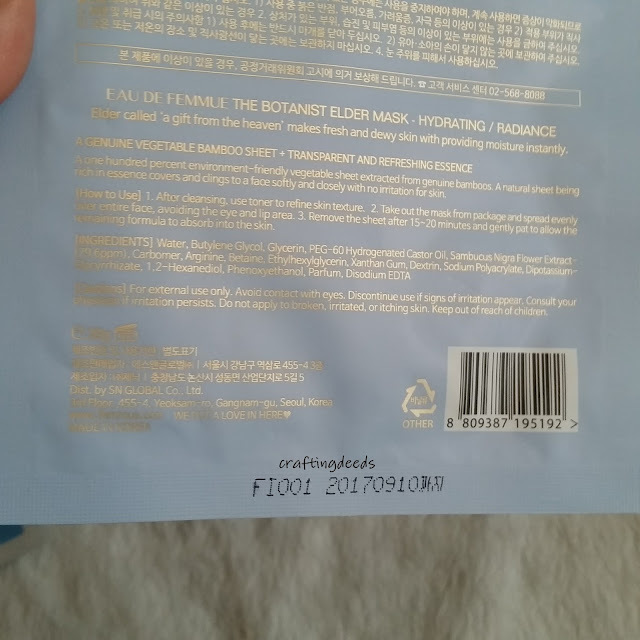 I finally decided to give it a try after my friend kept on raving about it to me and wanted me to let her know if there are any more sales on this mask. 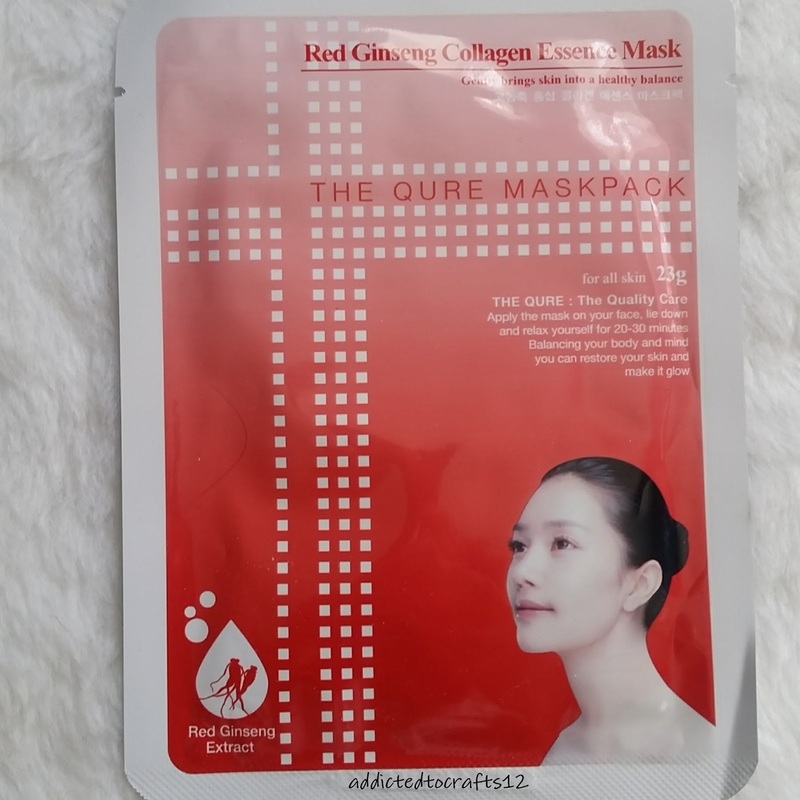 This is a thin mask that adheres well to the face and has a good fit with my chubby cheeks. 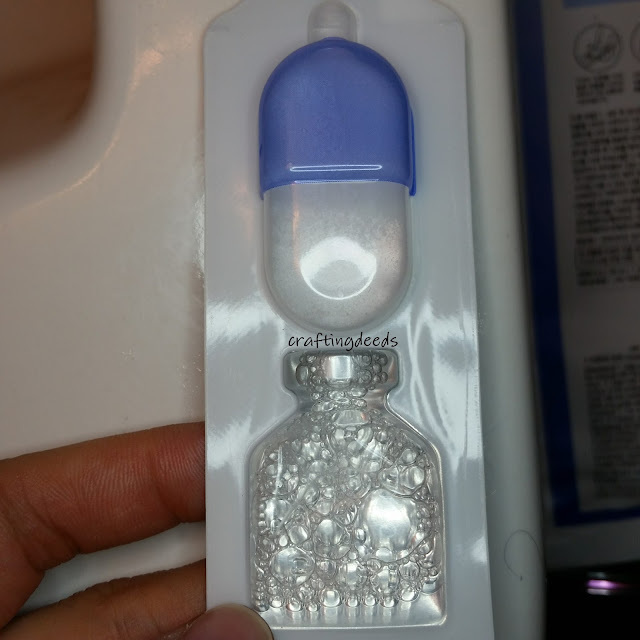 This has a watery gel essence that has a light medical scent to it. I had it on for 55 minutes as I lost track of time, and it was still relatively moist. My skin did feel tacky after I removed the mask and the extra essence took a bit to sink in. My face felt very moisturized, even till the next day and it made the makeup application so much easier. This is a definite repurchase item that I am constantly keeping an eye out for a good sale price. I received this as part of friend mail and I decided to give it a try as a pick me up treat after recovering from a bad bout of a virus. 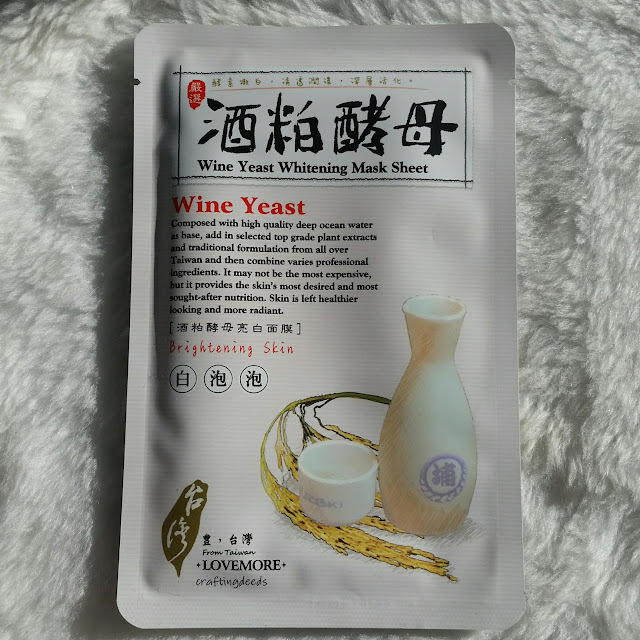 It is a vegetable mask that is made with bamboo extract, which felt quite thick, like thicker than any normal cotton sheet masks. 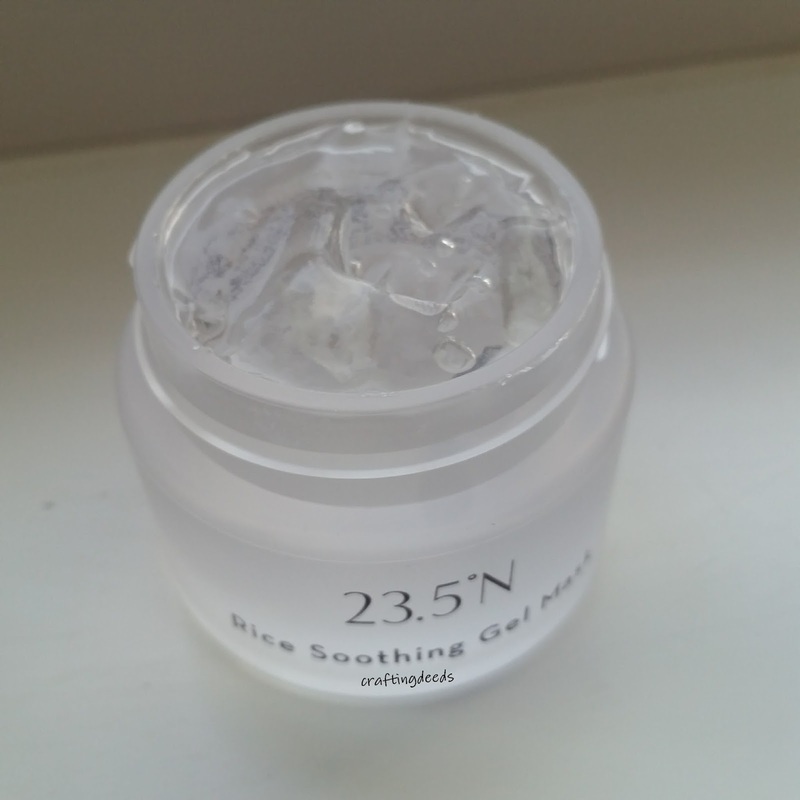 It is drenched in clear essence that has a very faint scent to it and has a very good fit with my chubby cheeks. I had it on for about 25 minutes and the extra essence sunk in quickly and was not tacky. My skin felt cool to the touch for a while and feels way more hydrated than it had been for the last while. Definitely would repurchase this if it goes on sale again. 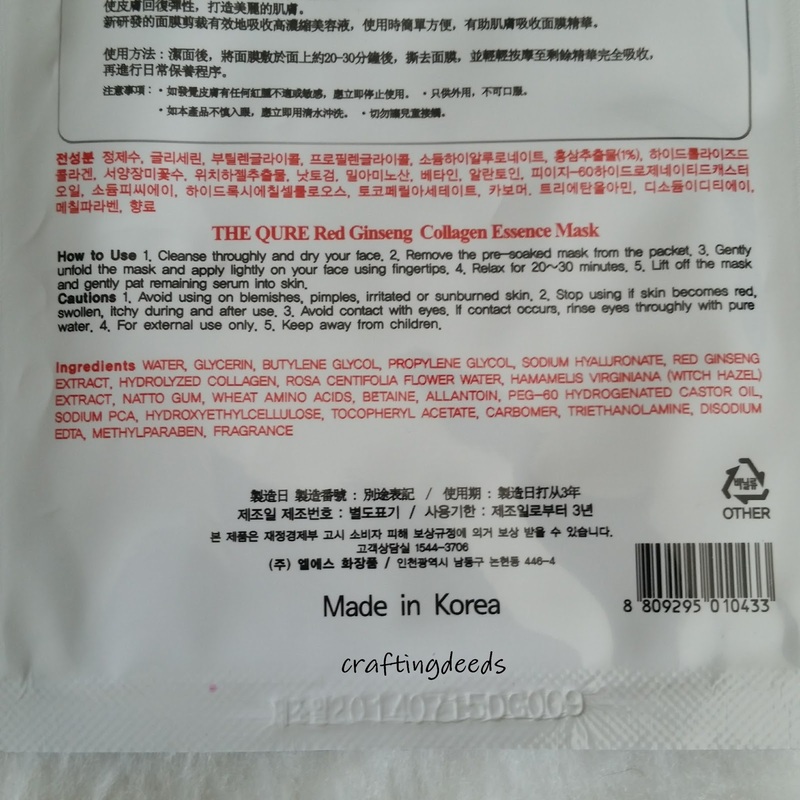 This is a sample of a gel mask I won from OoeyDewy and it is a thick gel mask that can either be a wash off mask or a leave on mask. 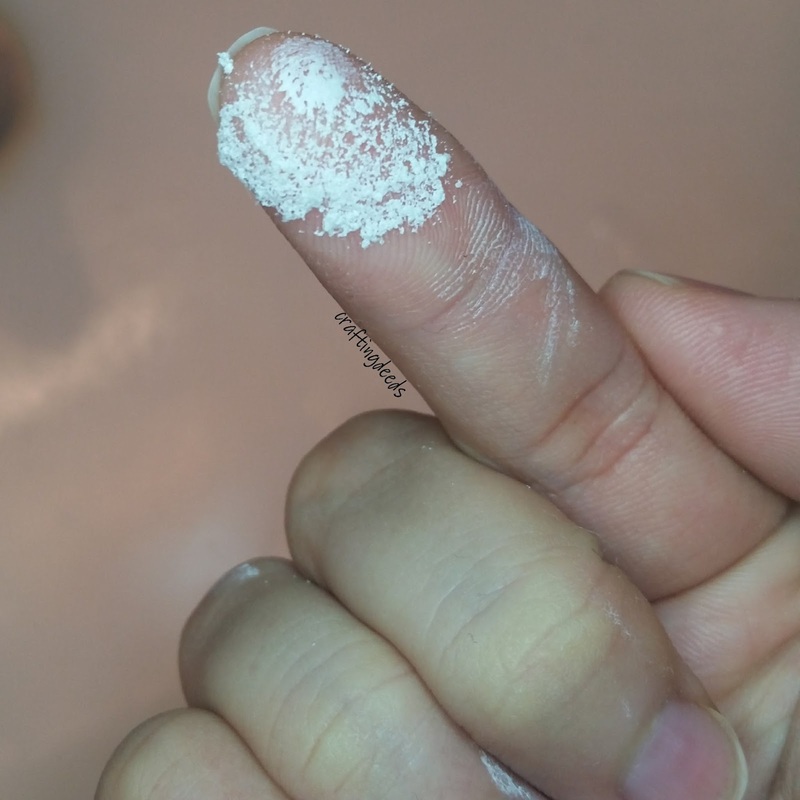 If you slap on a thick layer and then you can wash it off after 15 minutes. 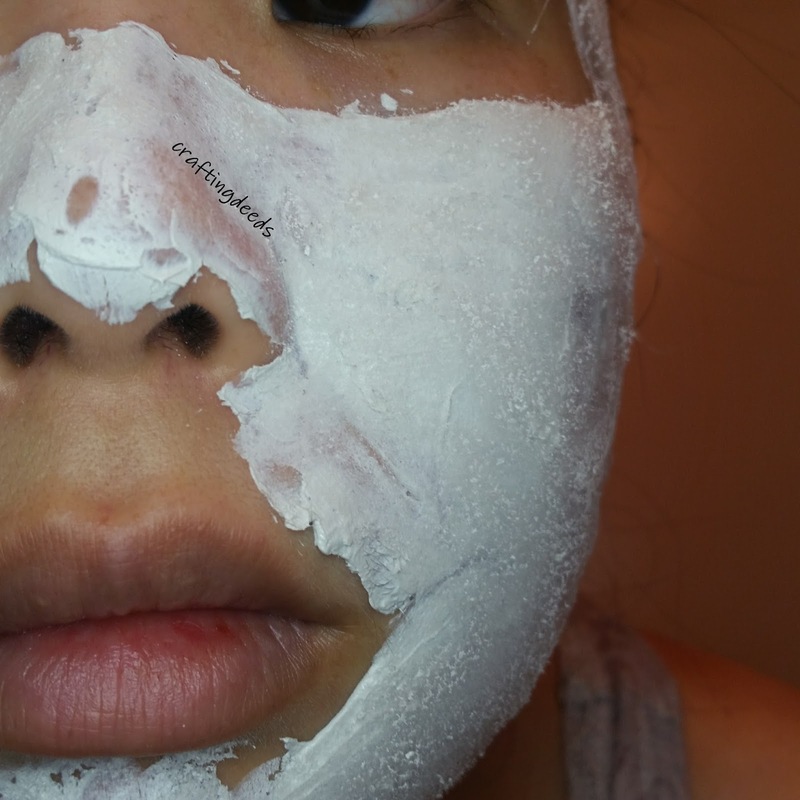 Or you can choose to put on a thin layer of the mask and it will can be left on like a sleeping mask. 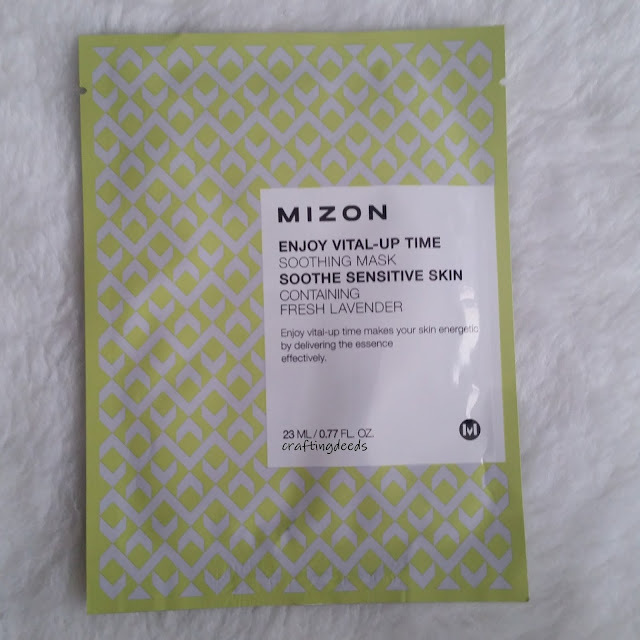 I tried it both as a wash off and a leave on mask but I wasn't too impressed with the results as my skin usually aren't irritated. I ended up using it on my nose and upper lip area when I was sick, as that area became irritated with the constant contact with tissues. I was impressed with the results as it made the irritation go away after I continued to slap some on each time I blew my nose. I definitely want to try the moisturizing line from 235N. I am still working on how I want to do my mask reviews. I tend to post it on Instagram but I would like to keep up content on the blog too. Would it better to post the reviews as I am posting it on IG or should I do a collection like I am doing now? Let me know in the comments, please and thank you! 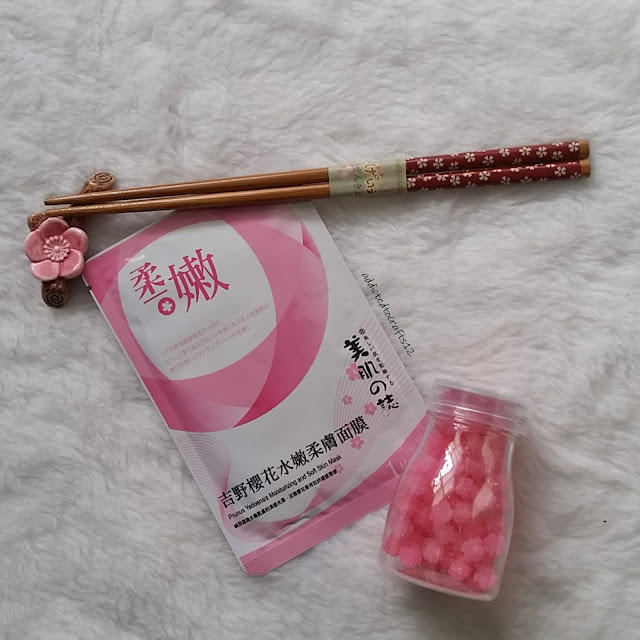 The first mask to be reviewed is the Beautymate Prunus Yedoensis Moisturizing and Soft Skin mask, which I ordered from BGO as a bundle pack that came also came with a cute headband. 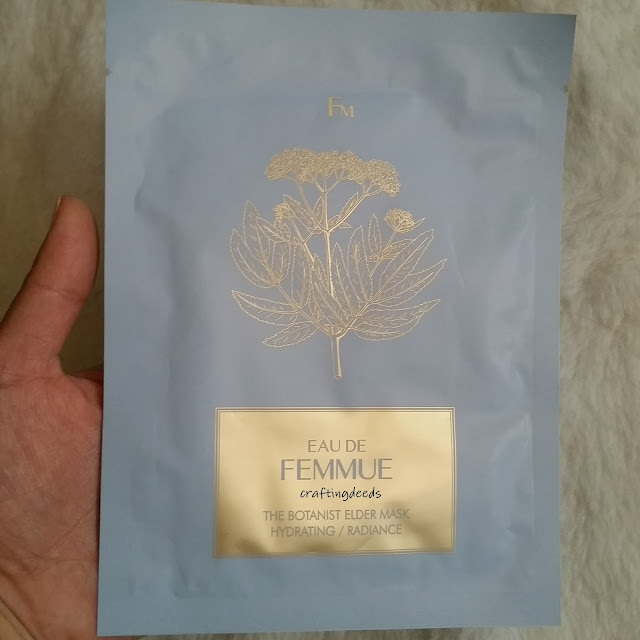 This is my favourite from the three different Beautymate masks I have tried. 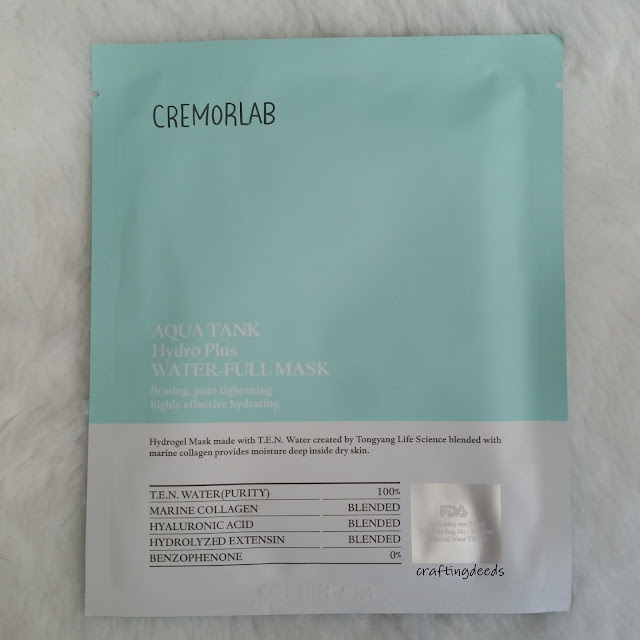 The mask is made from a fibrous material that is designed to trap the essence and help your skin drink it up while allowing it to breathe at the same time. The mask is drenched in a clear essence that is slightly thicker than serum but is not thick enough to be called a gel. It has a faint woodsy smell to it, which reminds me of this sakura wood charm I own. I had it on for about 15 minutes as per the instructions and at this point, the mask was starting to feel like it is drying out. I left the extra essence to sink in instead of wiping it off because I am a rebel like that. 😎 It sunk in quickly, within a few minutes, and my skin already looked plump. 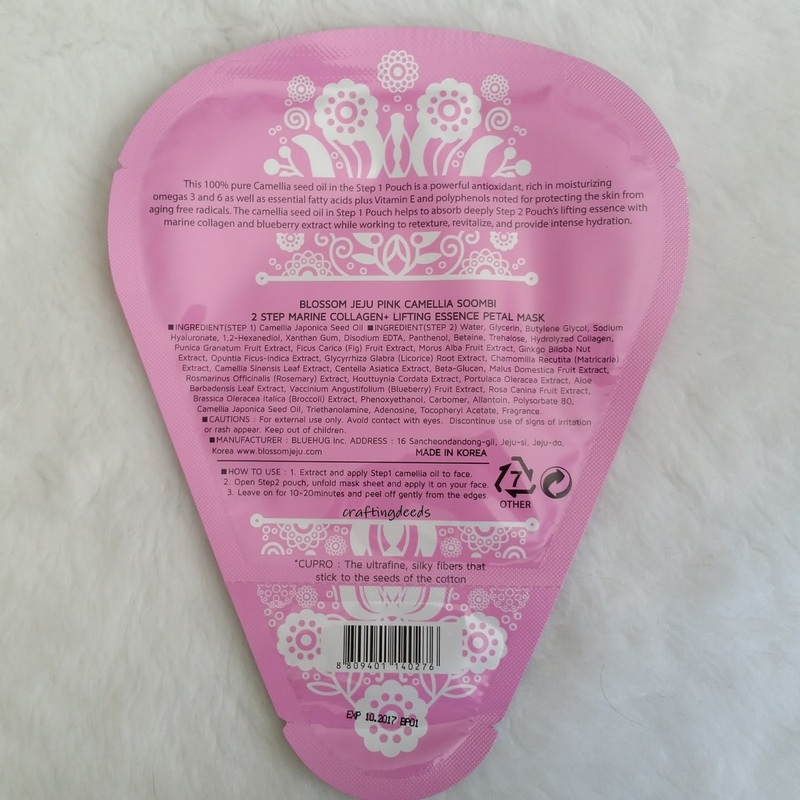 I love this mask as it made my skin feel soft and plump. I would definitely repurchase this mask if I can figure out how to reorder it since I don't want to place a gigantic order through BGO. 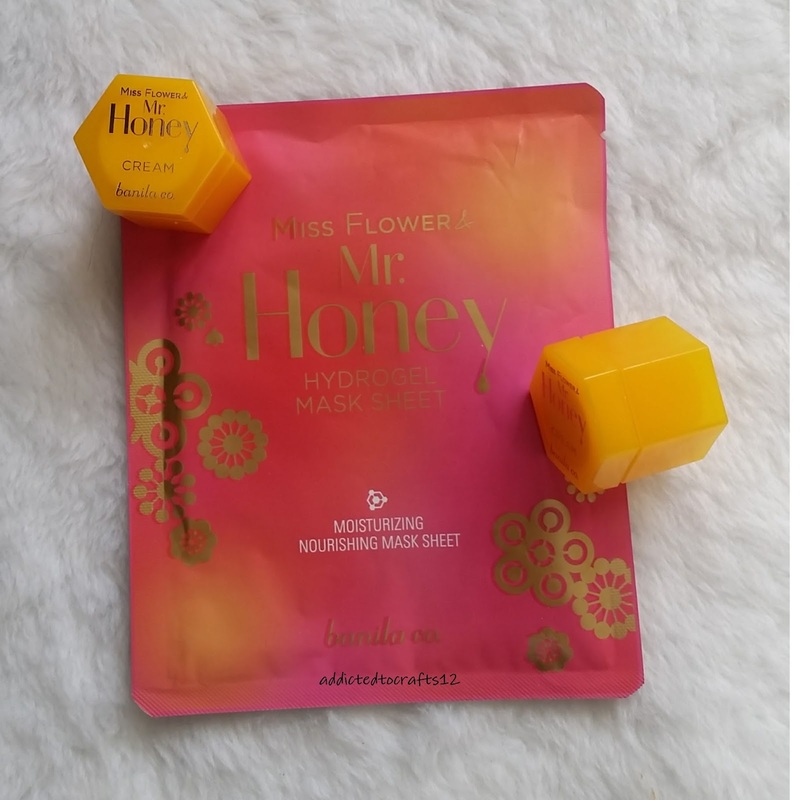 I love the Miss Flower & Mr. Honey cream so I was looking forward to using this mask. It is a gold hydrogel mask that is drenched in a clear serum like essence that smells like roses. It's quite lovely scent actually, more like rosewater. However, I didn't like the material for the mask as it is quite thin and flimsy so I wasn't able to make it sit properly on my face. I ended up with lots of bunched up spots or tenting on my face. Not what I look for in a mask. I lost track of time and had the mask on for 45 minutes, but it was only 5 minutes more than the recommended time so it's okay. 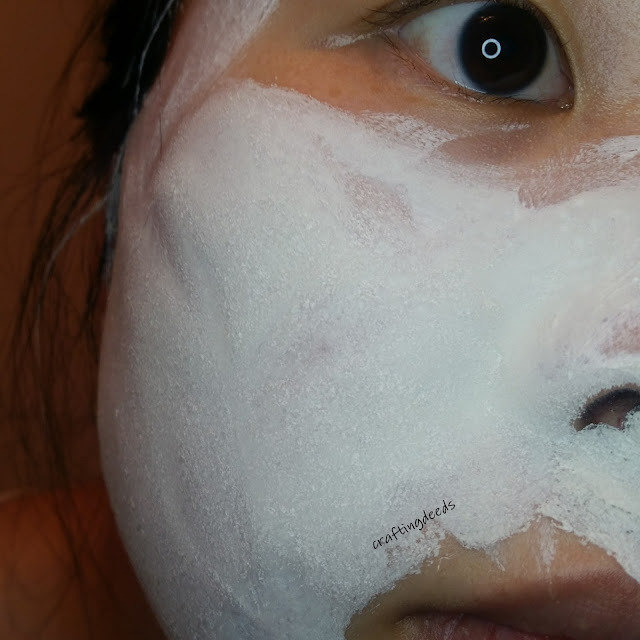 The mask was still moist but starting to dry at the upper lip area, which is usually the first place to dry up. The extra essence sunk in quickly and was not sticky. I think the mask is more a cooler weather kind of mask as it was more than enough to make up for the rest of my routine. However, I probably won't repurchase the mask as I am not a fan of mask that won't sit properly on my face that cost me around US$4 when I can get a super fitting mask like Leaders coconut get masks for around C$2 each. 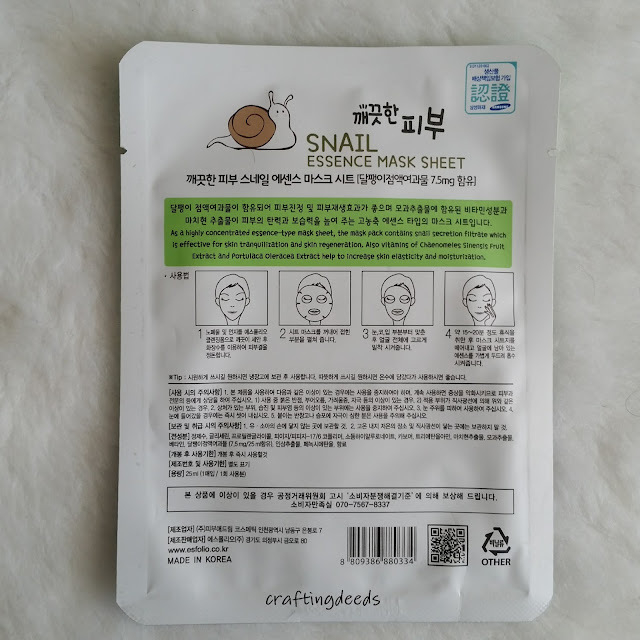 I got this in a variety pack from My Scheming a while back and finally decided to give it a try after my skin got clogged up from the excess sweating thanks to heatwaves. 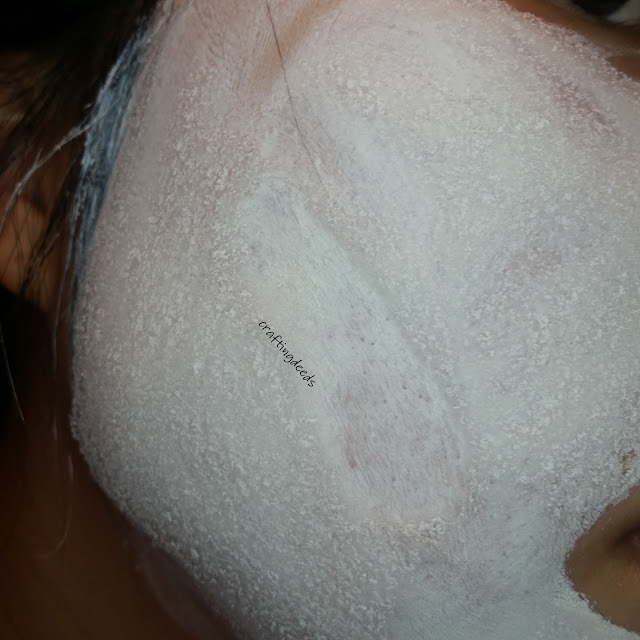 This is a thin silk mask that is drenched, and I do mean drenched, in a light saline solution scented essence. I absolutely loved the fit of the mask as it looks like I have nothing on my face. I had the mask on for 25 minutes, at which point it was only starting to dry out. This was surprising to me as this is such a thin mask! The essence sunk in quickly and was only ever slightly tacky to the touch. It made my skin feel tight and was not moisturizing. But it did calm down my skin as I woke up the next morning and all the bumps I felt has gone down. I would repurchase this mask if it gets on sale and I happen to see it. The Leaders mask is always one of my favourites. They tend to work well for me so I am always looking to stock up on them. This is a thin mask sheet that is almost as thin as the My Scheming silk masks as it also looks invisible on me. The mask is drenched in gel like essence and has what I call the typical leaders scent. if you tried a Leaders mask before, you will know what that smell is. I had this on for about 20 minutes and the upper lip area was starting to dry up. I forgot how sticky the essence is and had to use my essences to cover it up as it wouldn't go away with time. It did make my skin very well moisturized and it made applying makeup so much easier in the morning! I am definitely going to repurchase this once I cut down my mask count. 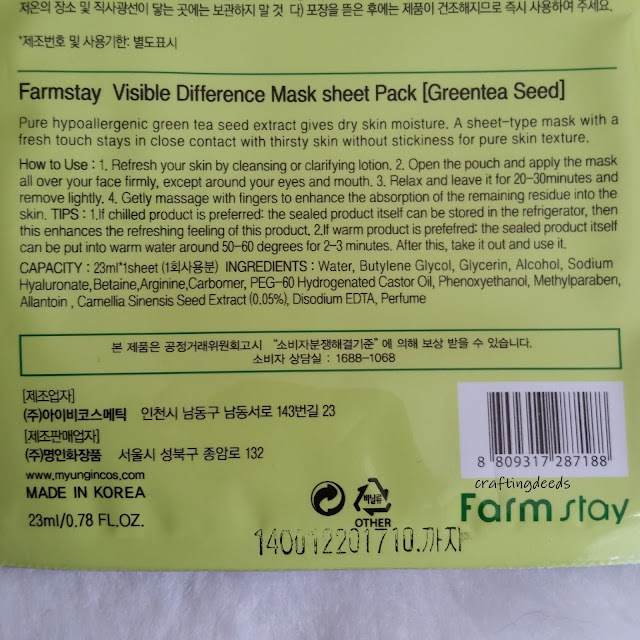 I received this mask from a variety pack I ordered from Mask Genie (no longer in business) and I put off using it since I am not a fan of the ginseng scent. But I thought my skin needed a pick me up so I decided to use it. Like I thought, this mask has a strong ginseng scent to it. But luckily, it fades a little once it is on my face. The mask itself is on the thick side that is embossed with a double helix pattern. The mask wasn't drenched in essence. In fact, there wasn't much essence in the package at all. So I was surprised it actually lasted 25 minutes. The extra essence sunk in quickly and left my skin a little sticky. 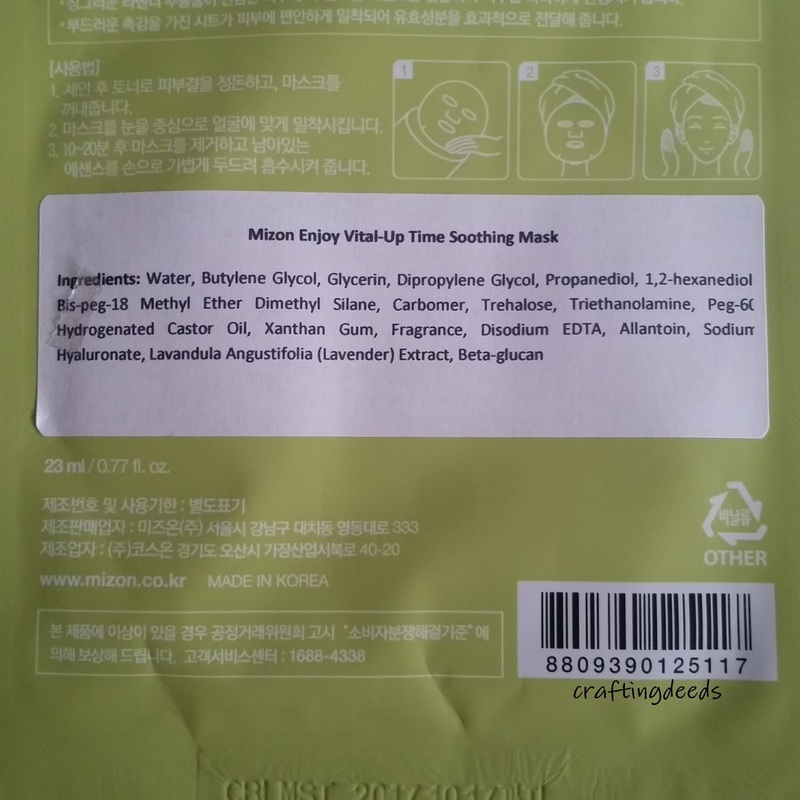 I am happy the ginseng scent goes away with the mask. It made my skin look noticeably brighter, which is surprising as I always have trouble identifying changes in skin complexion. So for me to notice it, it is a drastic difference. I wouldn't repurchase this as I am not sure where to find it and I am still not a fan of the ginseng scent. I didn't like the Esfolio mask, I will tell you this right now. It smelled funky, kind of "tangy" like it's drenched in alcohol. But there are no alcohol in the ingredients list. The mask looks dry and there was no extra essence. As per my Google search, the mask should be drenched in essence. So that's not a good indicator. I tried to put the mask on my face but that strong scent was too overwhelming and I had to throw it away. I am chalking this up to maybe the mask being close to expiration. I can't resist buying any of the banana flavoured masks so I was looking forward to using this mask from The Saem. 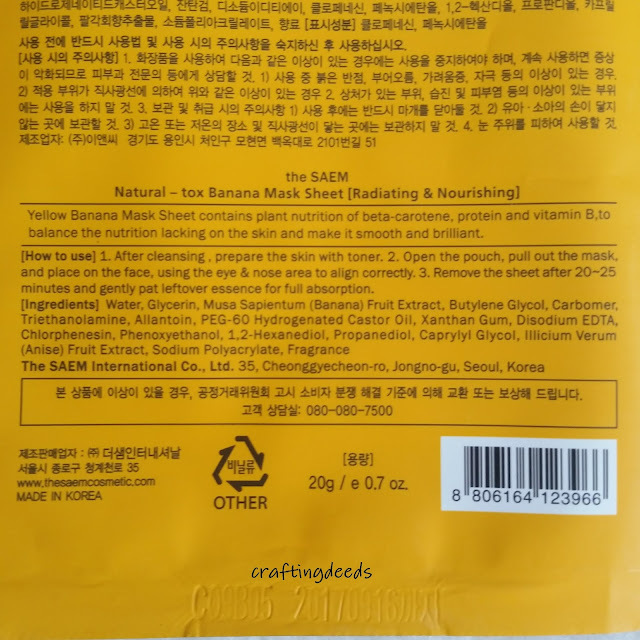 It is a textured cotton sheet that is drenched in a serum like essence that smells like banana pudding or one of those Korean banana milks. I do want to offer a word of caution that you should be careful when adjusting the mask as it tore easily when I tried to test how easy to pull it part. I had it on for 20 minutes and the mask stayed moist for the entire time, which was surprising since it started off being moist. I really thought it would have dried out by the 15 minutes mark at the latest. The extra essence sunk in quickly but was ever so slightly tacky. But it made my skin feel plump and happy which I was excited to see. 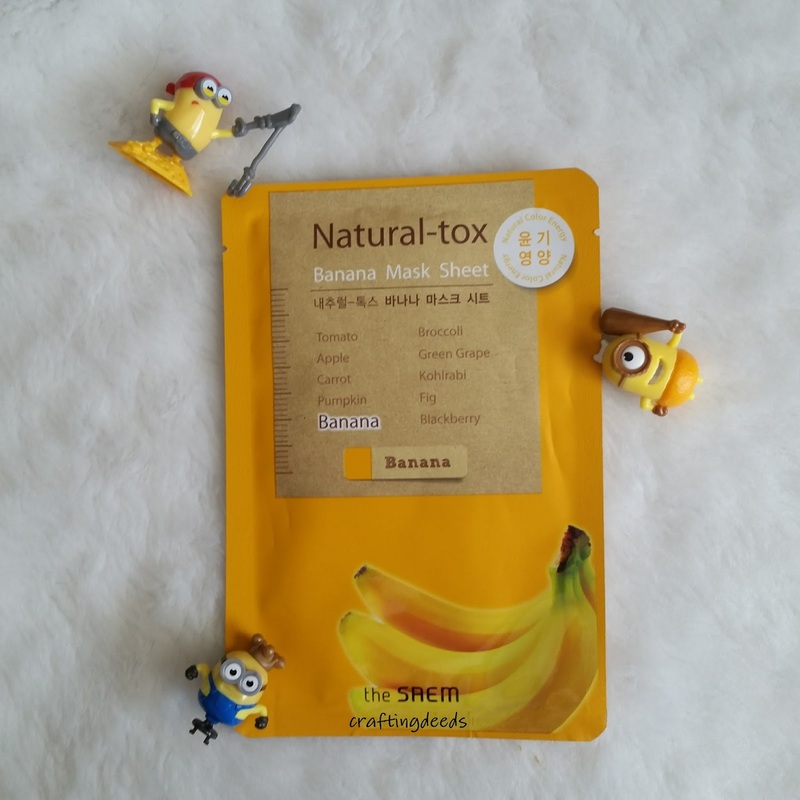 Especially when the mask is supposed to nourish the skin, which it has done! 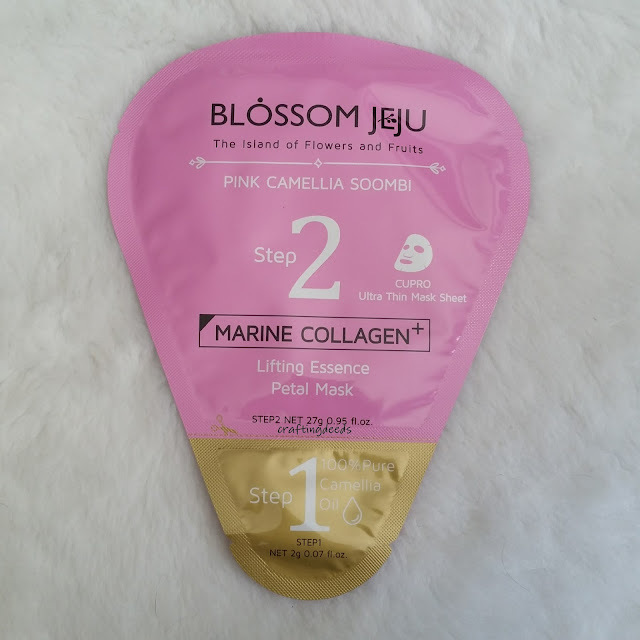 I would repurchase it if The Saem is still producing this mask. I got this from MaskGenie and decided to give it a go. 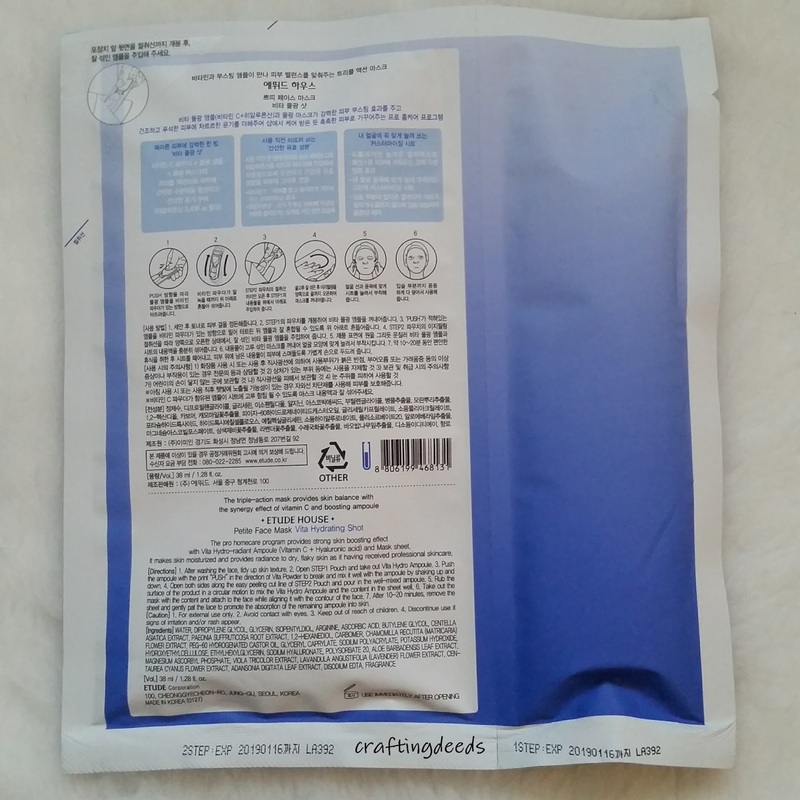 It is a normal sheet mask that is covered in serum like essence. It does contain alcohol, and I can clearly smell that distinct tangy scent. So my hopes were not high for a mask that has alcohol as the 4th ingredients. I had it on for 20 minutes as it was starting to feel dry to the touch. There was plenty of essence left on the skin and it sunk in quickly and does not feel sticky at all. It actually made my skin feel super soft and the pores appear to be smaller. I was surprised by the result given how high alcohol is on the ingredients list. I will not repurchase this, despite the great results, as it was pointed out to me that it has methyparaben which may react with UVB rays and increase the aging process. So yah.. I don't want to age faster than necessary so this isn't going to be repurchased. I bought this as it is one of those two step masks that you mix right before usage. I haven't tried one of those masks before so I thought I give a shot. It is a two step mask, where step 1 has the ampoule and powder that needs to be mixed and then insert into the step 2 sheet mask. I would have loved for this to work, but the step 1 failed on me miserably. 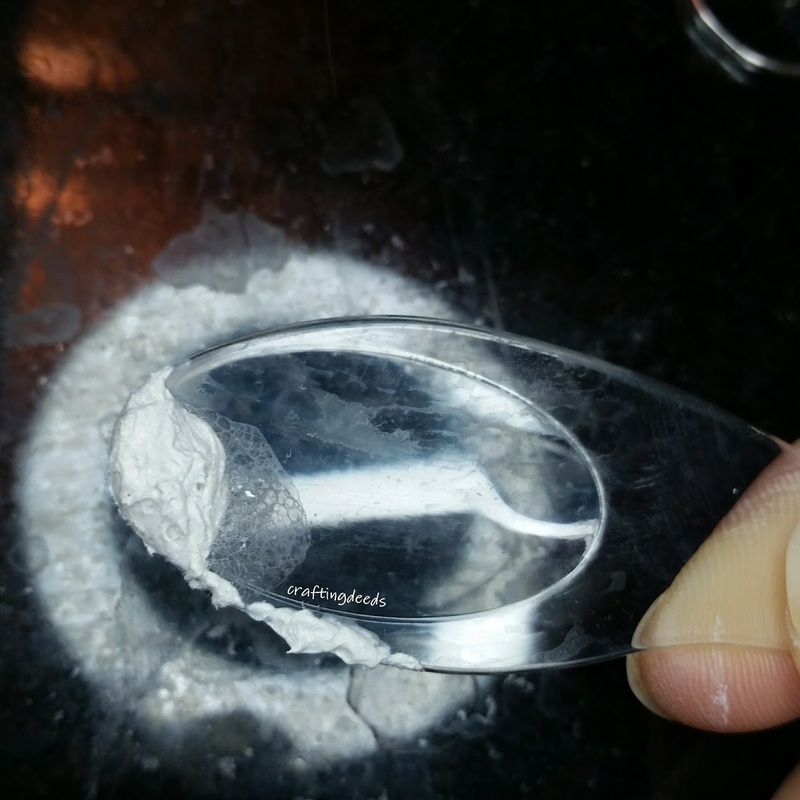 It popped from the side seam instead of forward into the powder. 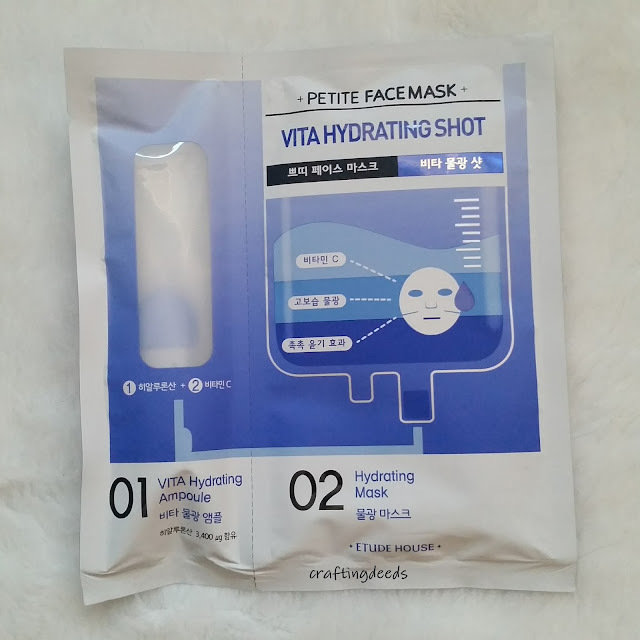 So I had to insert the remaining ampoule into the sheet mask while the powder remained in its lonely container. The mask itself was pliable and hugged my skin and I am thankful it was already soaked with some essence. Otherwise it wouldn't even sit on my face. The mask had weird slits, where it made me kind of look like Miss Swan. I mean seriously, head on over my IG and see for yourself! I had it on for 35 minutes and it was still very moist. The extra essence sunk in very slowly and it made my skin feel a bit tacky for a while. My skin did end up feeling more moisturized but I really wish I could have seen what the full effect of the mask would be. I obviously would not repurchase as this failed on me miserably and I am not willing to spend another $4+ to try it again. 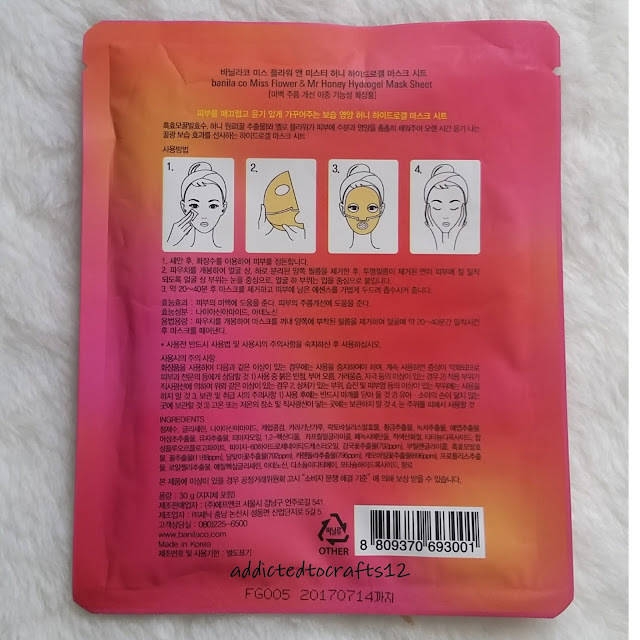 This mask series has been discontinued but I thought I give it a try anyways. 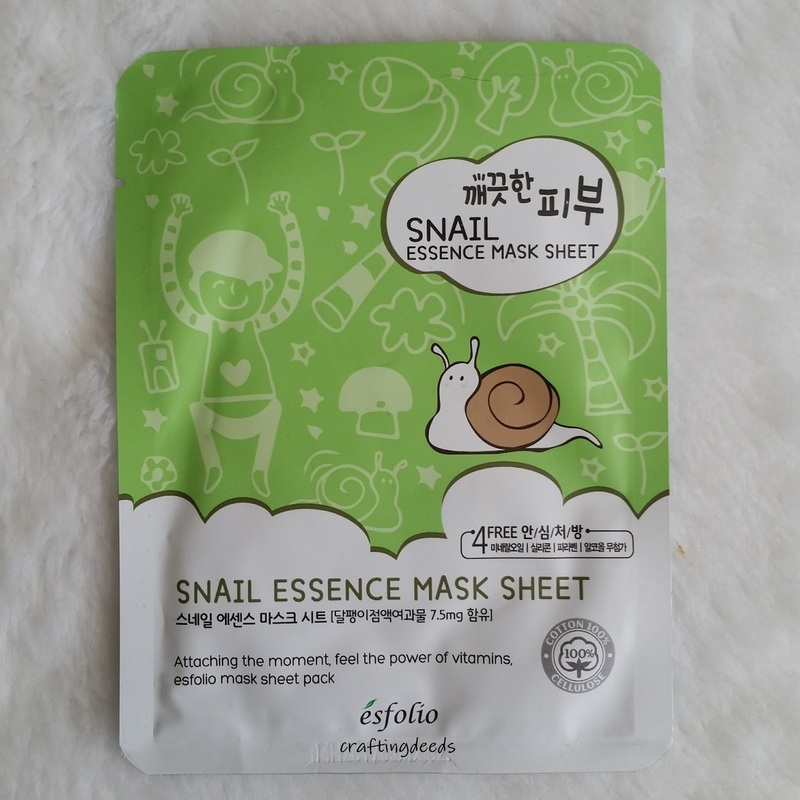 It is a regular sheet mask that is soaked in a milk essence that has a light non-discernible scent. I had it on for 25 minutes and the mask was only starting to lose contact with the skin. The extra essence sunk in quickly and not sticky. 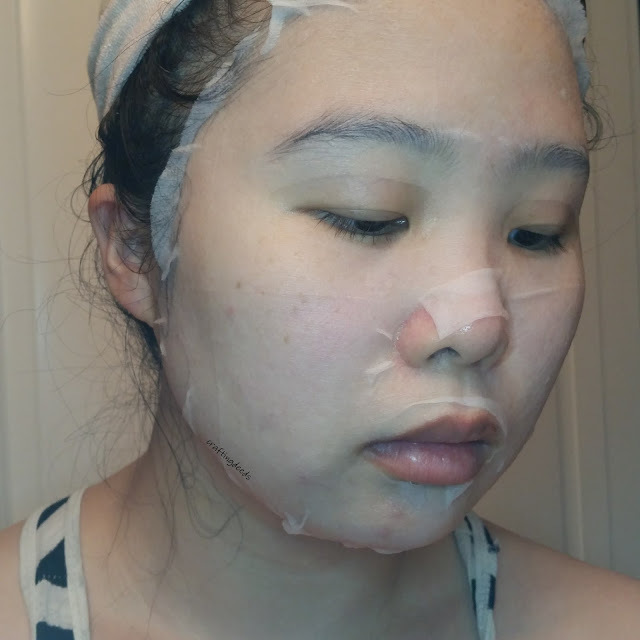 My skin feel softer afterwards but it felt like I had a layer of "oil" on top of my skin. 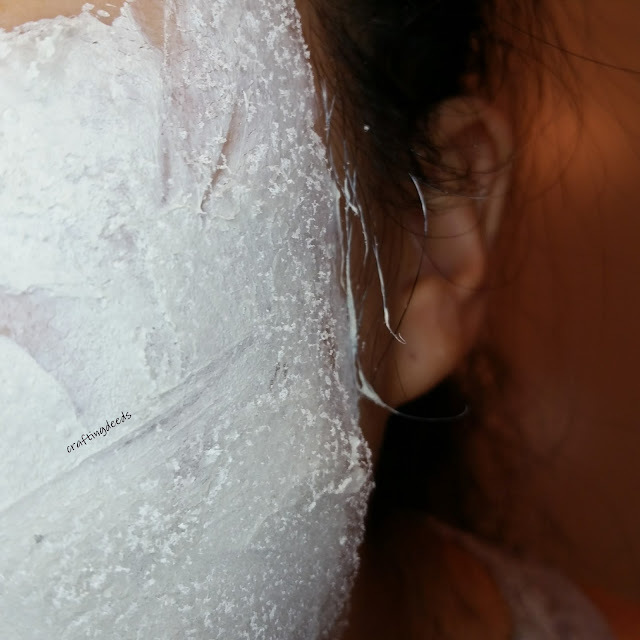 It kind of creates a barrier for the skin, which is kind of what it advertised to do. But I am not too happy with this barrier as it prevented the rest of my routine from sinking in. It made my skin feel soft and dewy but I don't like the fact that it feels like all my products are sitting on top of the skin instead of sinking in.